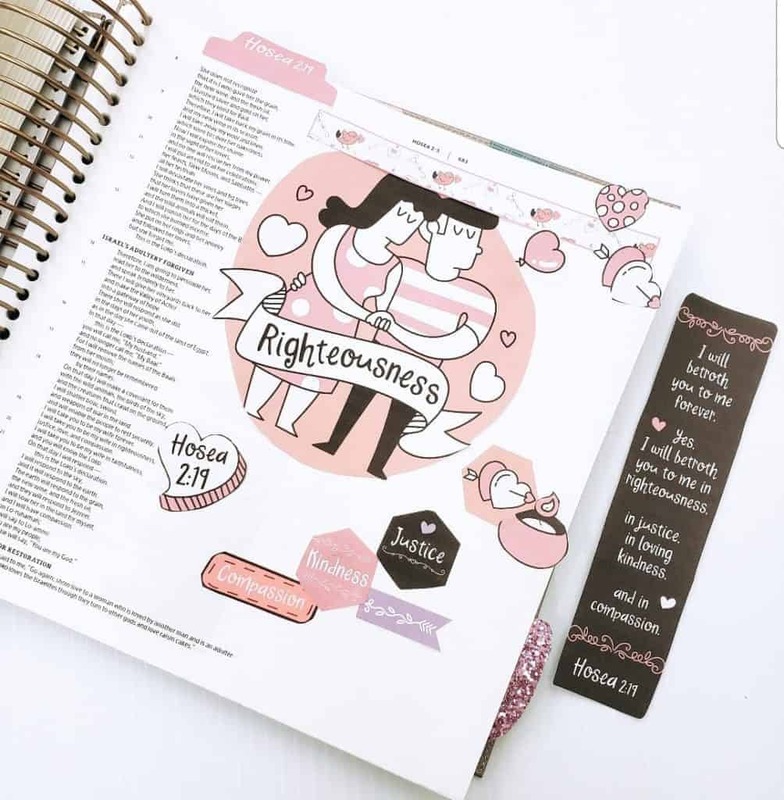 Momentum is an affordable digital monthly Bible journaling kit subscription program designed to help you build momentum in your journey to be in the word. 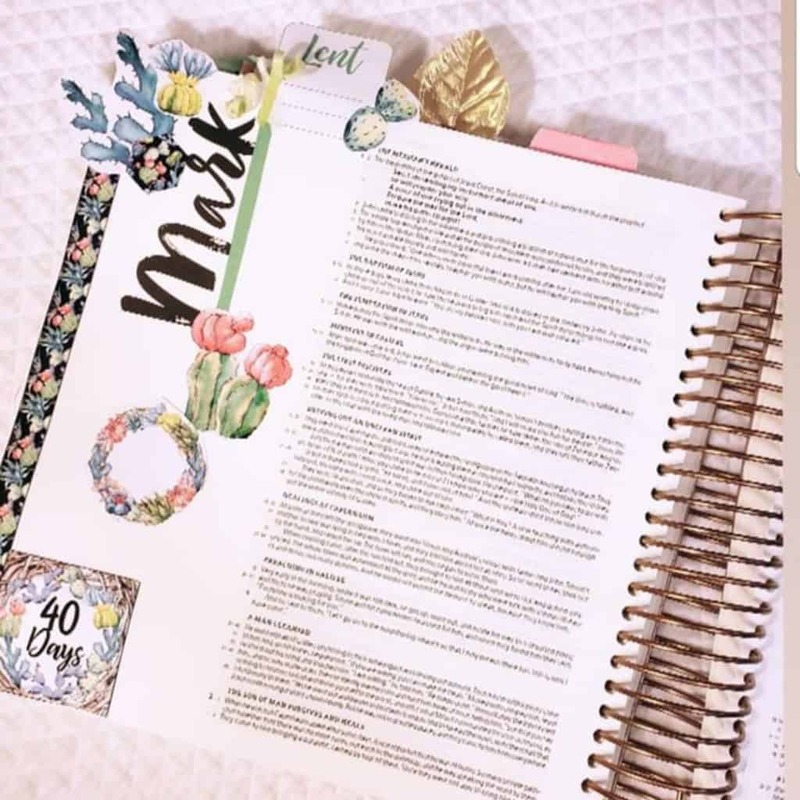 We make Bible journaling easy so that you can spend time in the Word consistently, without much preparation and without needing long blocks of time. 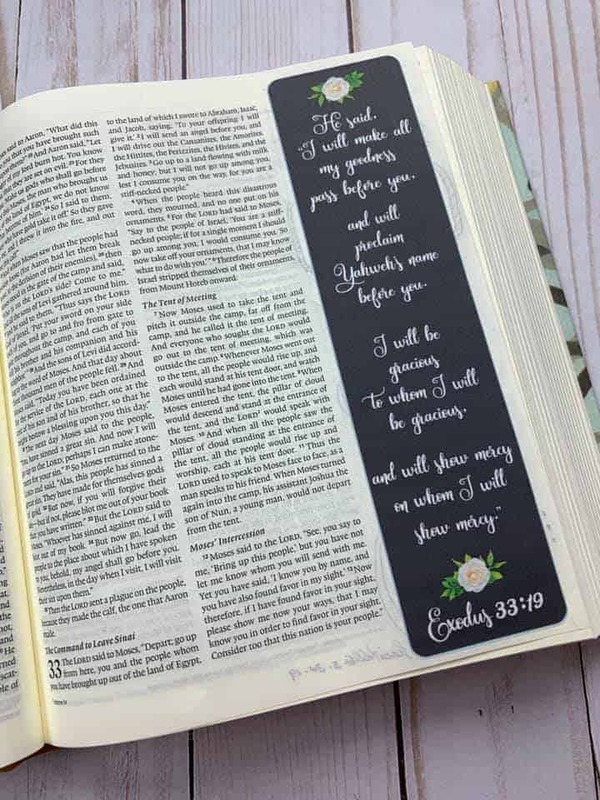 You can Bible journal and grow in your faith even if you only have five minutes! When you’re feeling lost, fearful, or have slipped away from your faith, remind yourself of God’s love for you. 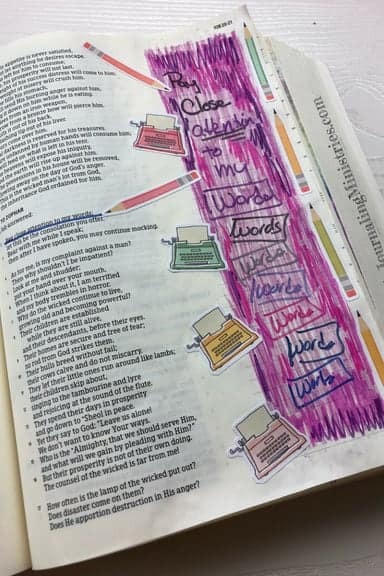 Try writing out your favorite scriptures in a Bible journal. Then, pause and spend some time meditating on the scripture that led to the beauty you created on the page. You can see what some of our members have created below using our monthly Momentum Kit. If you have any thoughts or questions, please join our social community. But love ye your enemies, and do good, and lend, hoping for nothing again; and your reward shall be great, and ye shall be the children of the Highest: for he is kind unto the unthankful and to the evil. By accepting grace, you acknowledge that God sacrificed his son for the sole purpose of giving grace to all sinners, making it a lot easier to receive His wondrous gift. 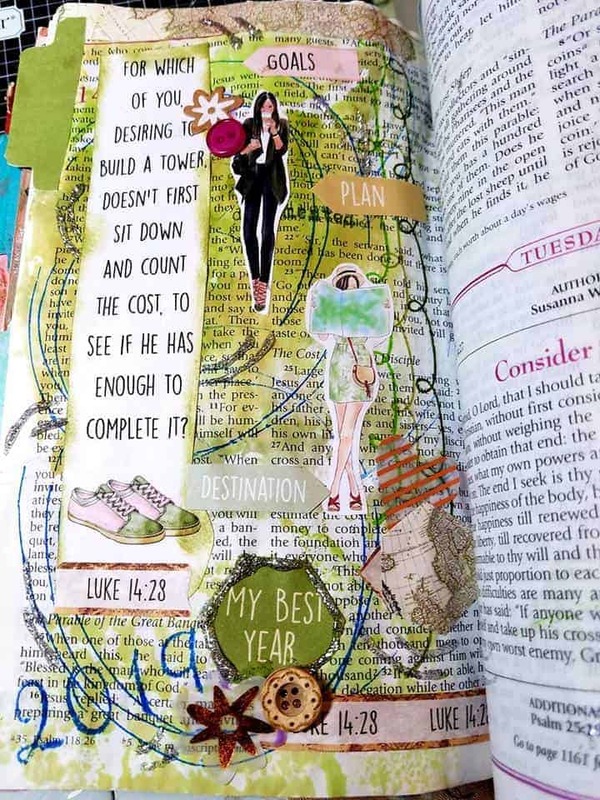 This spread was created by Mary from the Creative Faith Crew using cut-outs from our monthly Momentum Kit. The gift of grace is only realized in your life if you accept it. The problem is that accepting grace can be difficult, especially if you feel unworthy. Ask God for forgiveness and be willing to forgive yourself for things you did in the past. To be able to forgive yourself sometimes requires compassion, empathy, kindness, and understanding. You’ll also need to work against the desire to sin. So, forgive yourself and remember that every day is a new day. I created this page using cut-outs from this months Momentum kit. In everything if we just let go and turn to God…we see His grace and mercy. For I am His and He is mine. Missy, from our Creative Faith Crew. 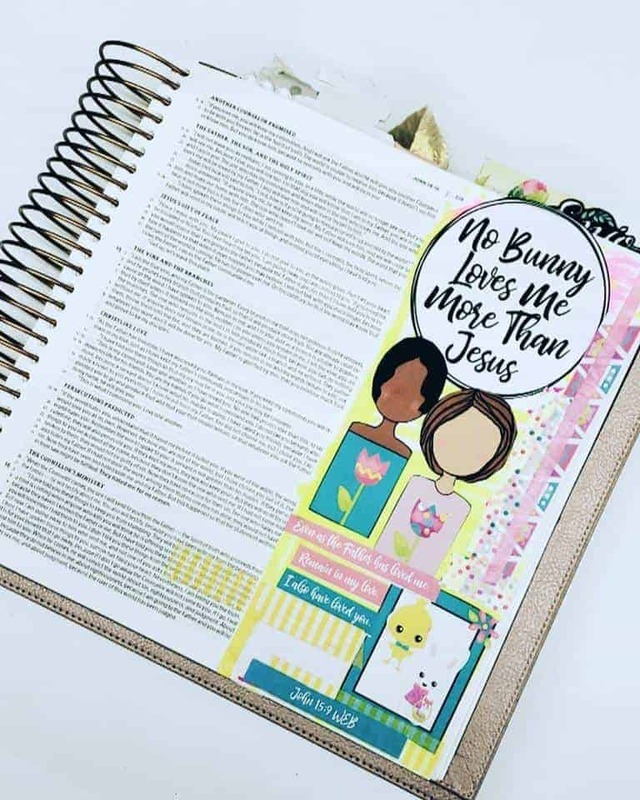 This fun background was created with gelatos, baby wipes, washi tape, and finished it off with Bible Journaling Ministries printables. And he said, I will make all my goodness pass before thee, and I will proclaim the name of the Lord before thee; and will be gracious to whom I will be gracious, and will shew mercy on whom I will shew mercy. So many people believe that they don’t deserve God’s grace. So, they try to earn it. Have you ever tried to give something to someone who wanted to reciprocate? It kind of diminishes what you were trying to do, right? That’s what you do when you try to earn grace. You diminish what Jesus did for you. Grace isn’t about what you deserve; it’s about what God gives. I created this page with printables from our latest Momentum Subscription. Tear your heart, and not your garments, and turn to Yahweh, your God; for he is gracious and merciful, slow to anger, and abundant in loving kindness, and relents from sending calamity. God’s Grace is truly simply amazing! Thank goodness that he doesn’t give us what we deserve! I cry out, repent & turn to him almost on a daily basis, only because the devil tries to convince me otherwise, oh I thank God for his mercies every day and gracious unconditional love for me & for you too. Thank you, Mary, for this lovely page! 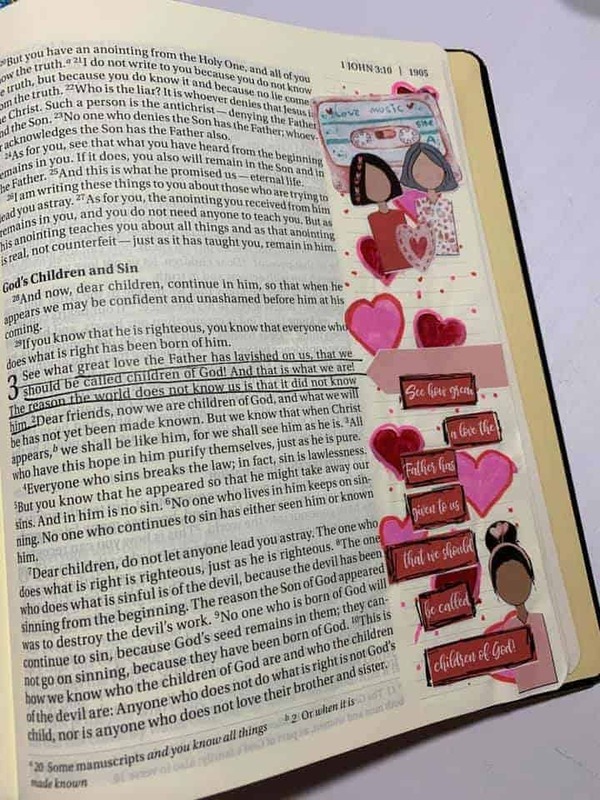 She used cutouts from our monthly Momentum Kit in her Illustrating Bible, added some ribbon and we love it! Give yourself over to God through prayer and ask Him to help you receive grace. He is ready to help you and hears clearly when you pray, worship, and study His word. Besides ensuring that we are saved by grace through faith, prayer is vital for a fulfilling life. To make any progress in life, we need to pray. 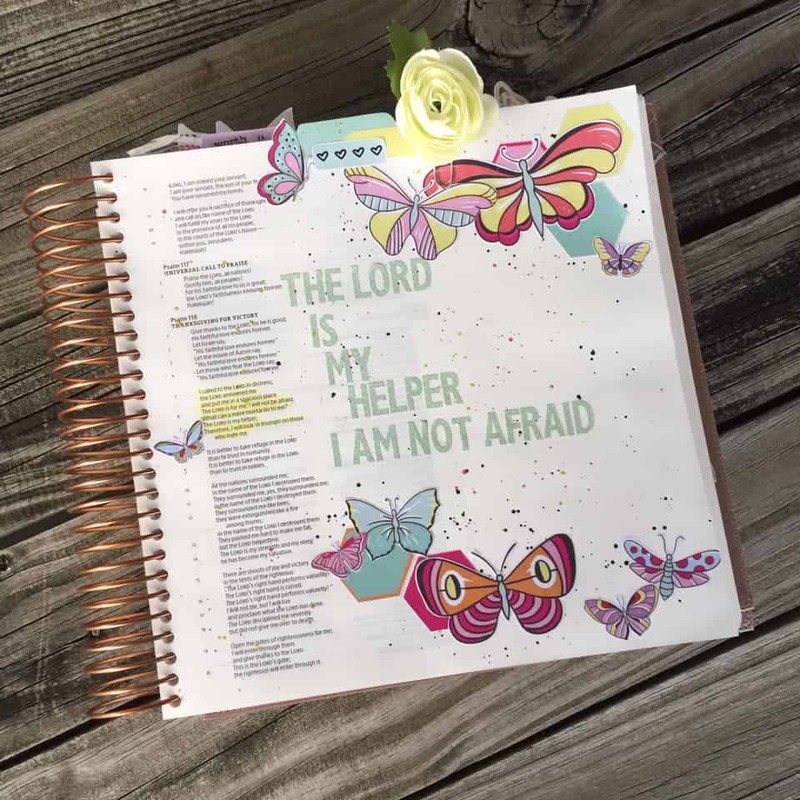 I created this beautiful page in her using Versafine pigment ink, & printables from Bible Journaling Ministries. And blessed is she who believed that there would be a fulfillment of what was spoken to her from the Lord. 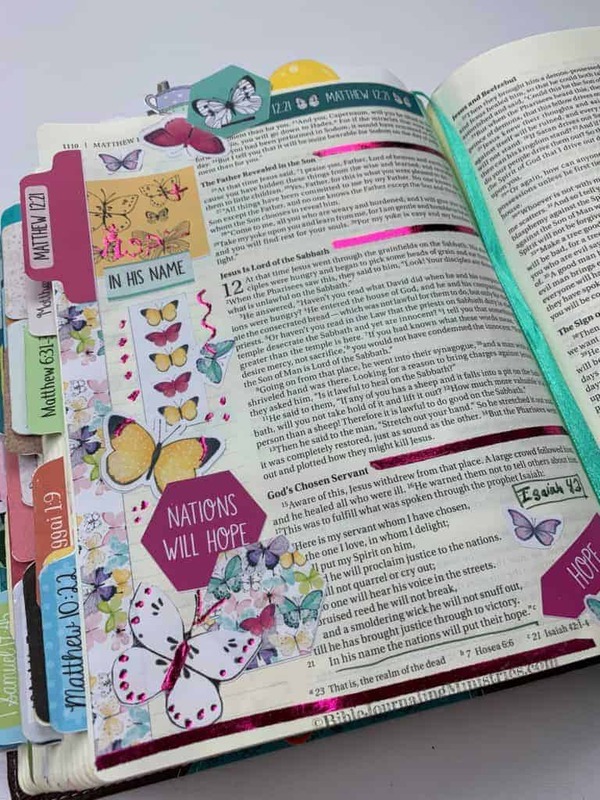 A huge thanks to Mary who created this page using washi tape, cross stickers, bow clip, colored pencils, markers and this month’s Momentum printables in her Illustrated Faith Bible journaling Bible. Super cute! Mary went back to the basics while creating this page. 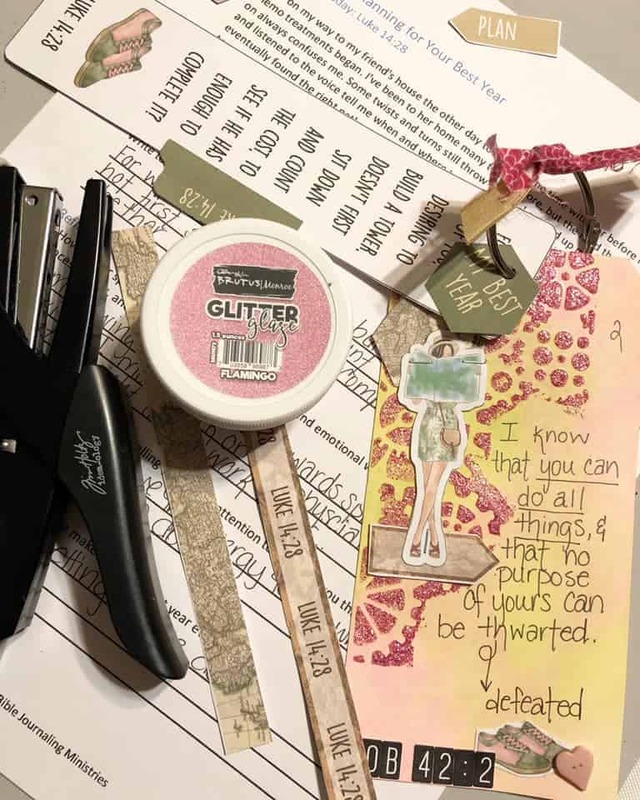 She used just some gelatos, washi tape, and some Bible Journaling Ministries printables. Cute and simple! The Lord answered Moses, “I will do this very thing you have asked, for you have found favor with me, and I know you by name.” Then Moses said, “Please, let me see your glory.” He said, “I will cause all my goodness to pass in front of you, and I will proclaim the name ‘the Lord ’ before you. I will be gracious to whom I will be gracious, and I will have compassion on whom I will have compassion. 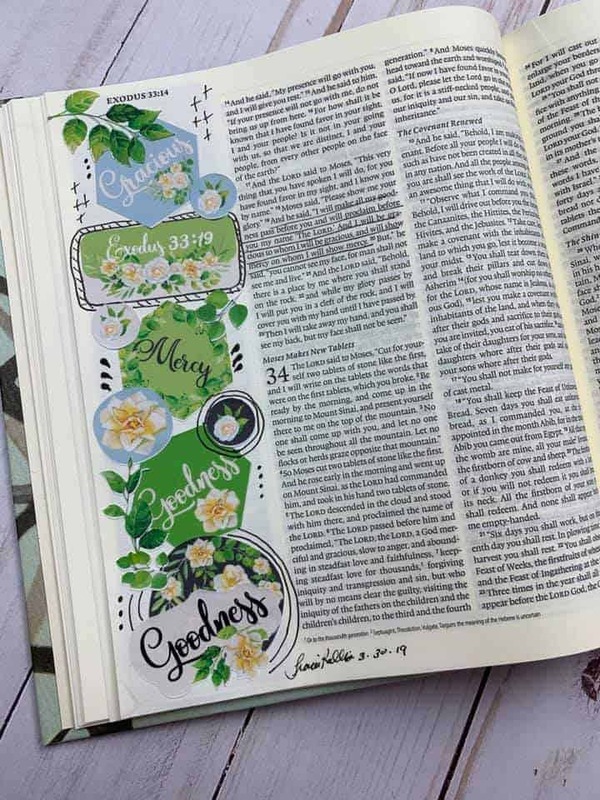 Msendenika from the Creative Faith Crew creathed this awesome page using acrylics, dayspring cards, and stencils in her Illustrating Faith Bible Journaling Bible. Job 11:18 “ Having hope will give you courage. 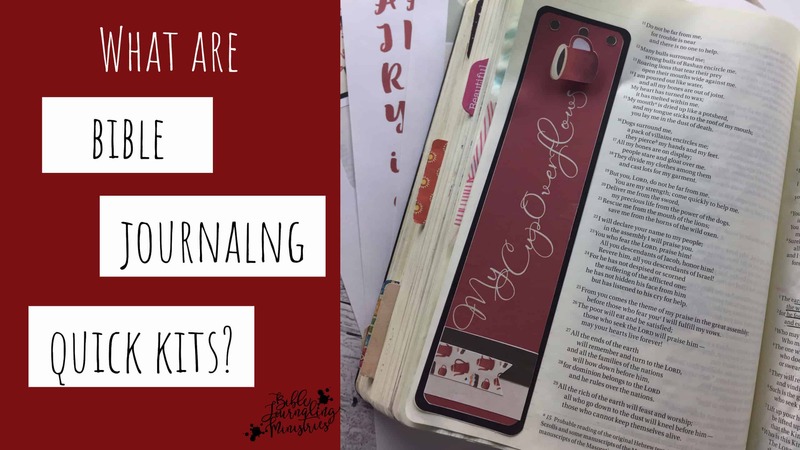 Need a little pick-me-up when it comes to your Bible journaling? Don’t give into your feelings of hopelessness! Romans 15:4 reads, “For whatever things were written before were written for our learning, that through patience and through the encouragement of the Scriptures we might have hope”. Our entire Faith Crew is here for you to give ideas, advice, and of course fellowship in the Word. If you have been waiting and looking for the right community to be a part to grow your faith, this is it. You can see what some of our members have created below using our monthly Momentum Kit. neither will anyone hear his voice in the streets. He won’t break a bruised reed. In his name, the nations will hope. Thank you, Msedenika from the Creative Faith Crew for creating this bright and beautiful page. 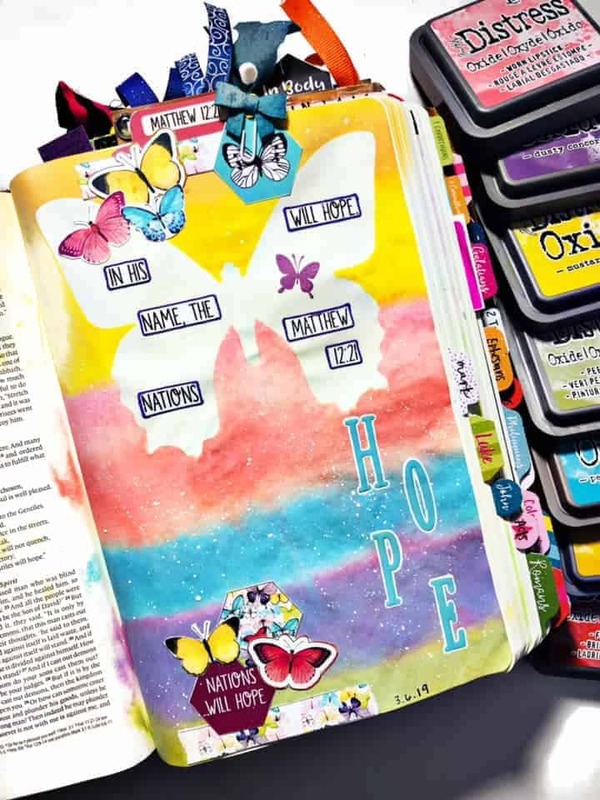 She used a Butterfly stencil, Distress oxide ink, alpha letters, and Momentum printables in her interleaved journaling Bible for this page. Exalt Him, all you peoples! Praise the Lord! Thank you, Amanda, from our Creative Faith Crew for creating this awesome page. 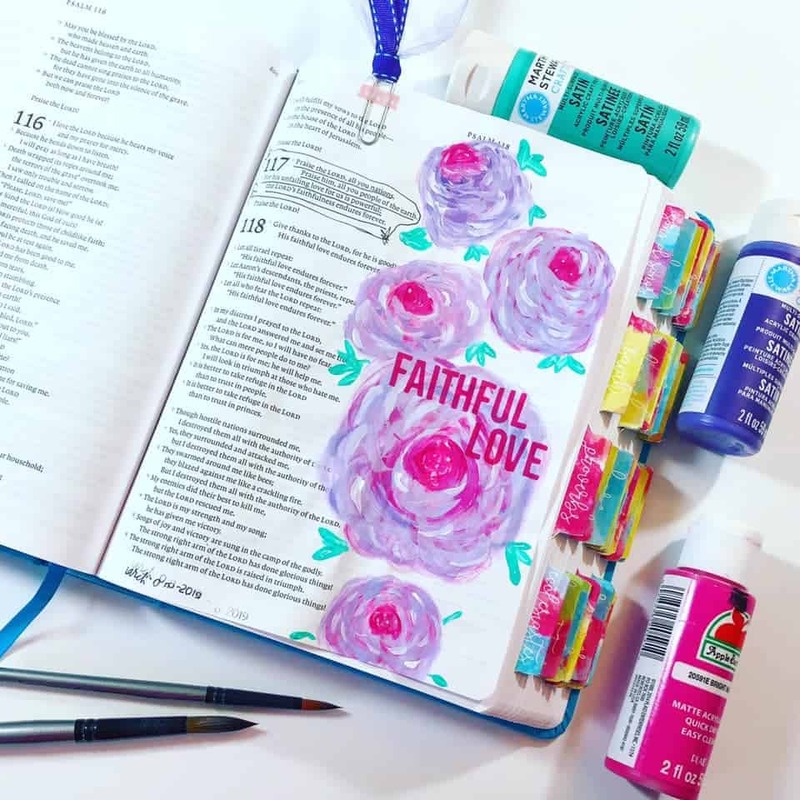 She followed a Bible Journaling Ministries tutorial in Momentum to paint these flowers in her Reflections Holy Bible. For to him who is joined with all the living, there is hope; for a living dog is better than a dead lion. 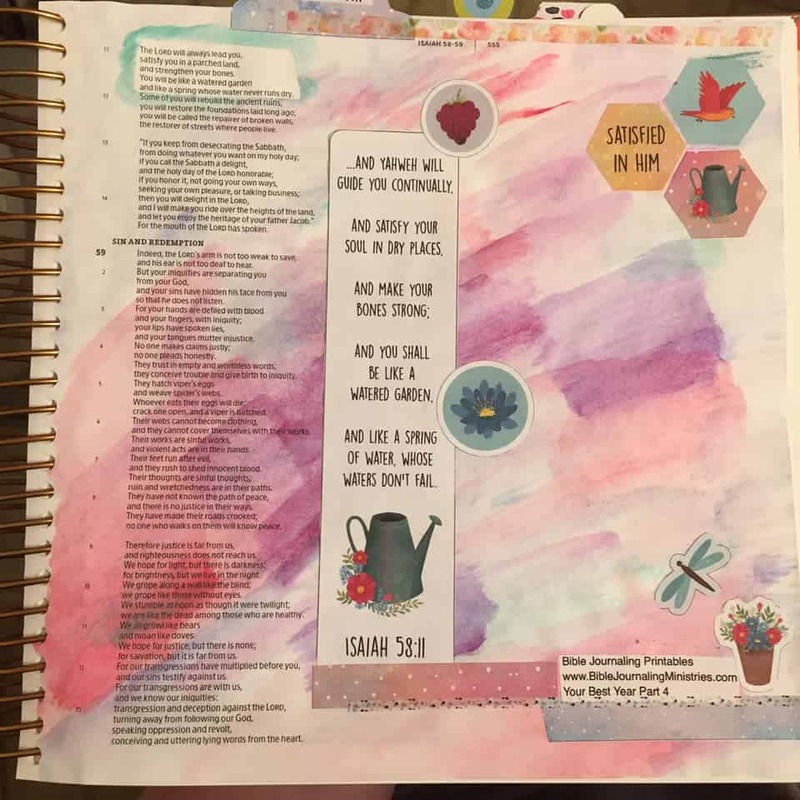 Msedenika created this amazing page using kuretake gansi tambi watercolors, Dayspring cards, and this months Bible journaling kit from Bible Journaling Ministries in her Illustrated Faith illustrating bible. But keep things for yourself in heaven. Insects and rust will not spoil them there. People will not get in and steal them. The place where you keep things is where your heart will be also. The body gets its light through the eyes. 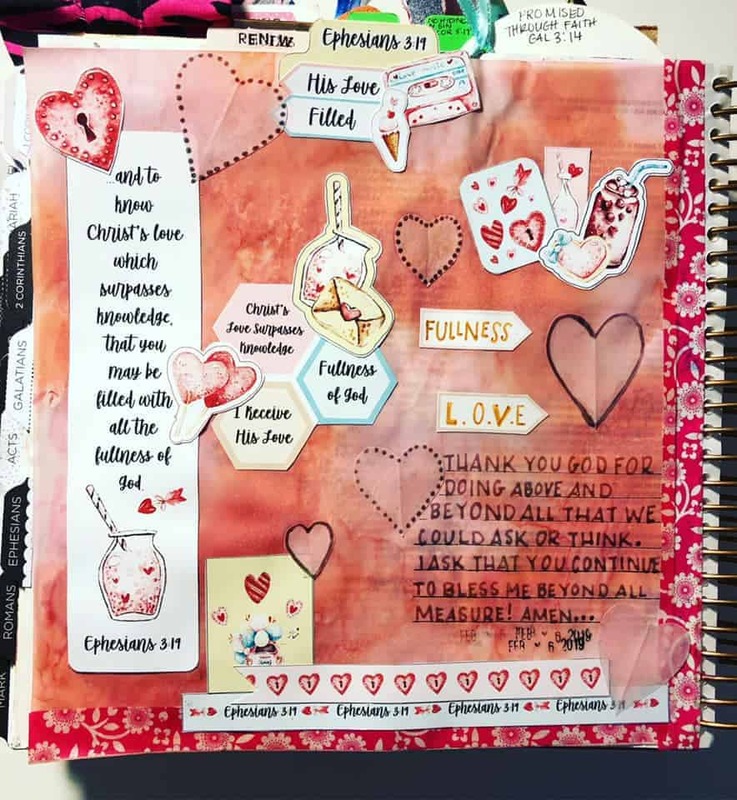 If you have good eyes, all your body will have light… This Beautiful page was created by Nikki Bunch from our Creative Faith Crew using Distress Oxide Ink, and cutouts from our monthly Momentum Kit. Immediately the Spirit drove him out into the wilderness. He was there in the wilderness forty days tempted by Satan. He was with the wild animals, and the angels were serving him. 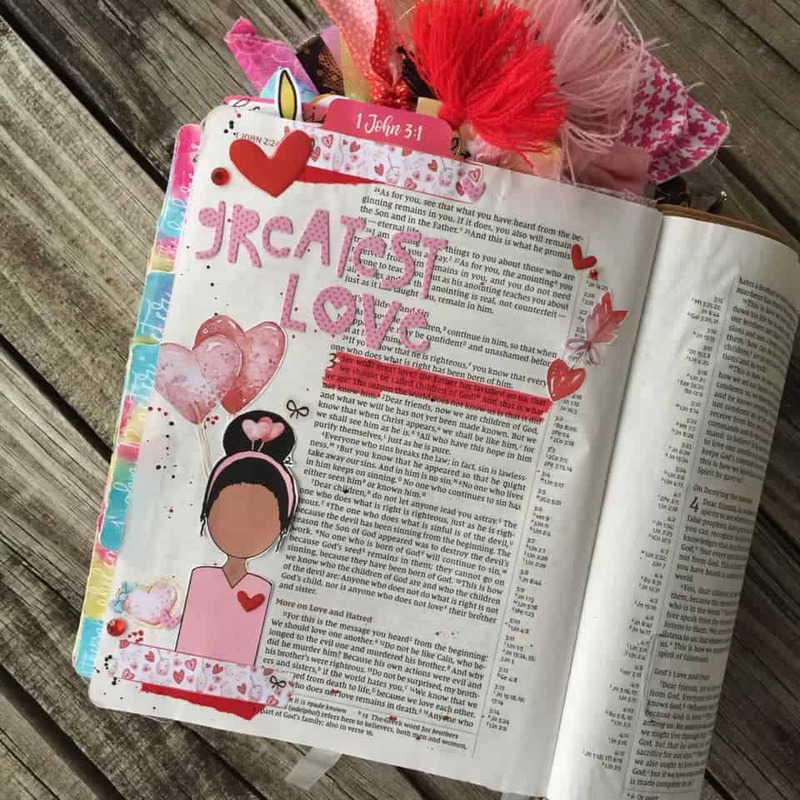 This beautiful page was created by ‭‭Msedenika from the Creative Faith Crew using Scribble Sticks and Alpha Letters in her Illustrated Faith Bible, and cutouts from our monthly Momentum Kit. 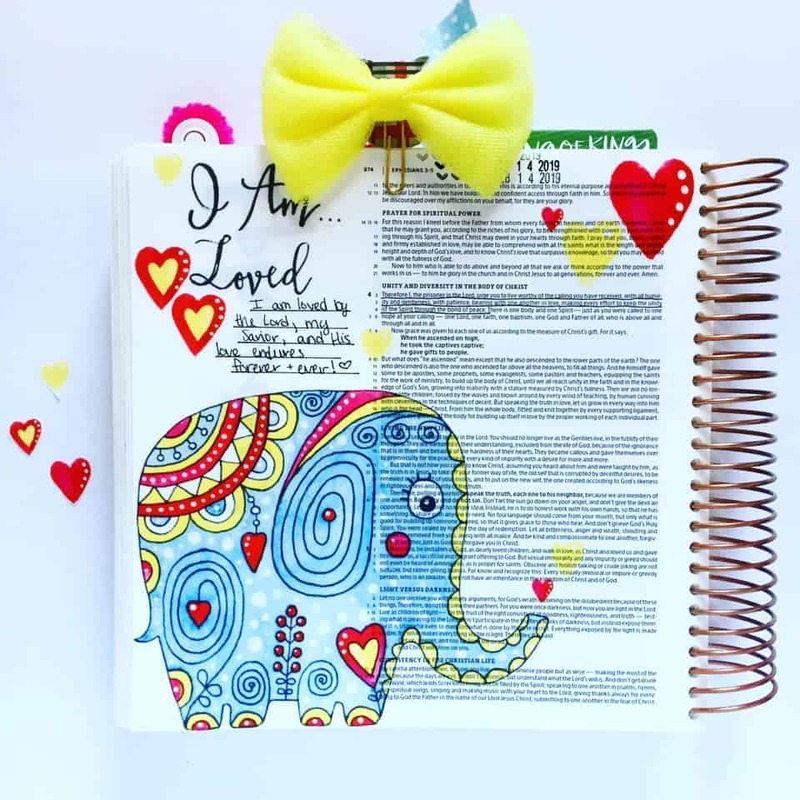 Taylor Myers, from our Creative Faith Crew, created this cute page! 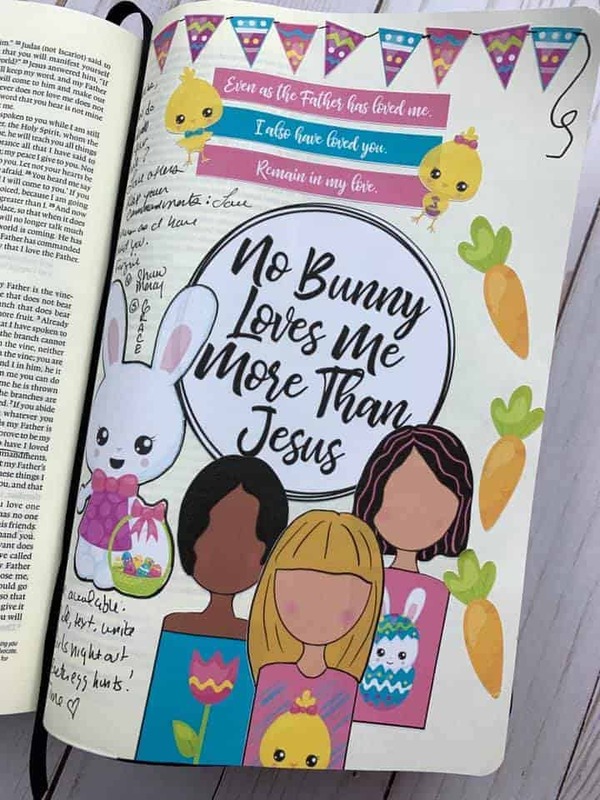 She used cutouts from this month’s Momentum kit from Bible Journaling Ministries and acrylic paint in her Illustrating Bible to make this page. But They that wait will renew their strength. They will mount up with wings like eagles. They will run, and not be weary. They will walk, and not faint. 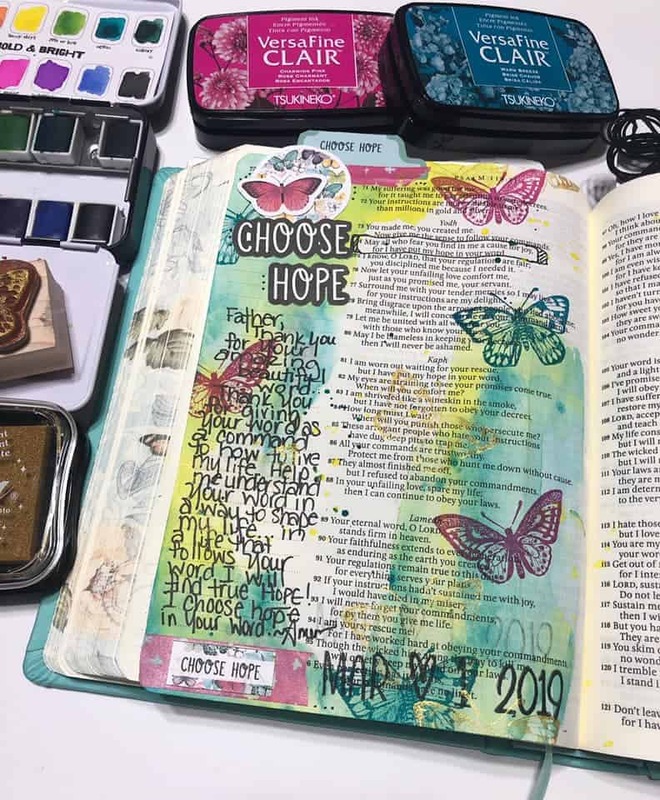 Msendenika, from our Creative Faith Crew, created this beautiful page in her Faith Illustrated journaling Bible, using Versafine pigment ink, Acrylic stamps, teal gel pen & printables from Bible Journaling Ministries. In his name the nations will put their hope. Huge thanks to Amanda Hargrove, from our Creative Faith Crew for creating this awesome page. She used cutouts, brought to you by this month’s Momentum kit from Bible Journaling Ministries to create thi. 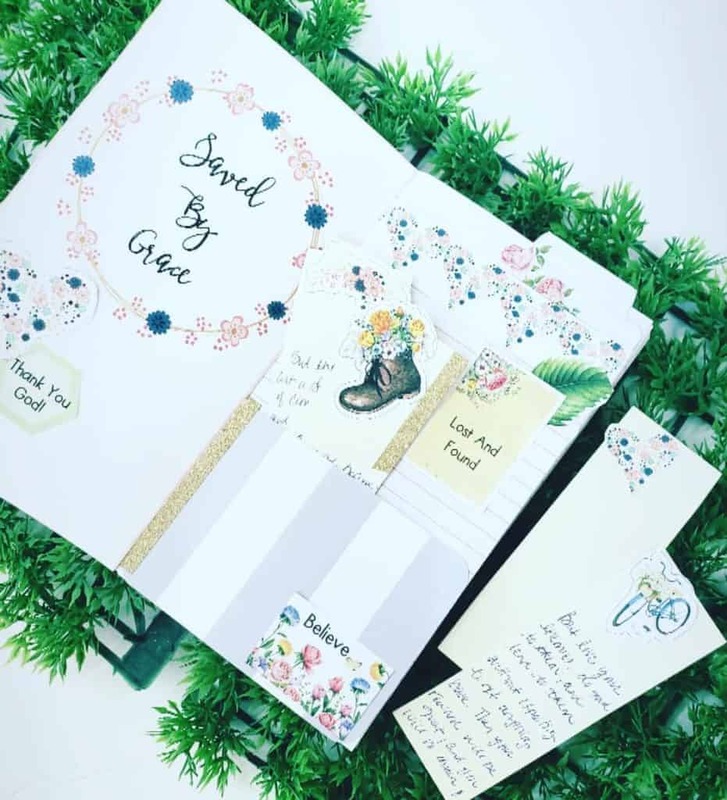 We are loving what she did with this page! 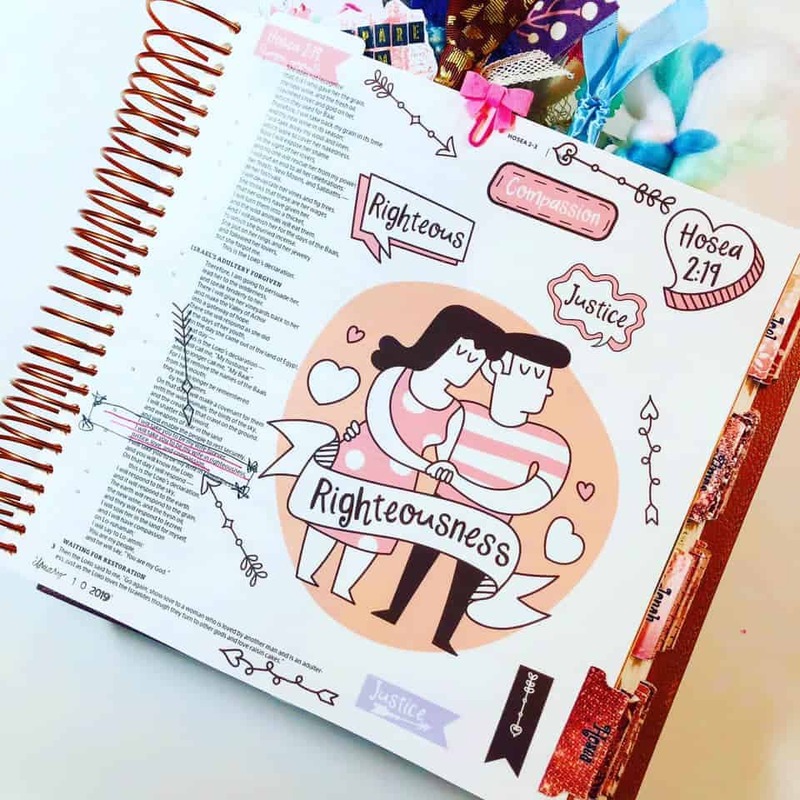 Momentum is an affordable digital monthly Bible journaling kit subscription program designed to help you build momentum in your walk with God. 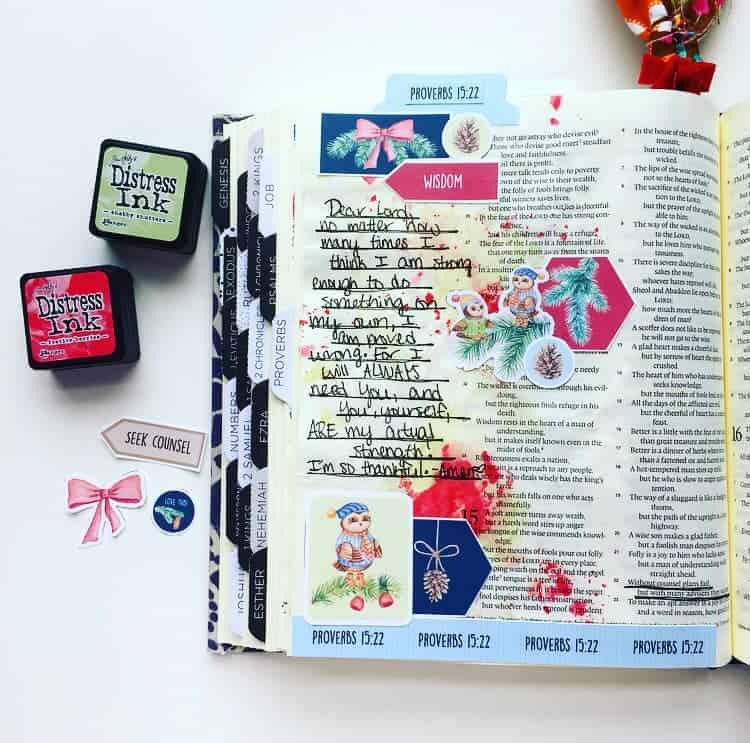 We make Bible journaling easy so that you can spend time in the Word consistently, without much preparation and without needing long blocks of time. 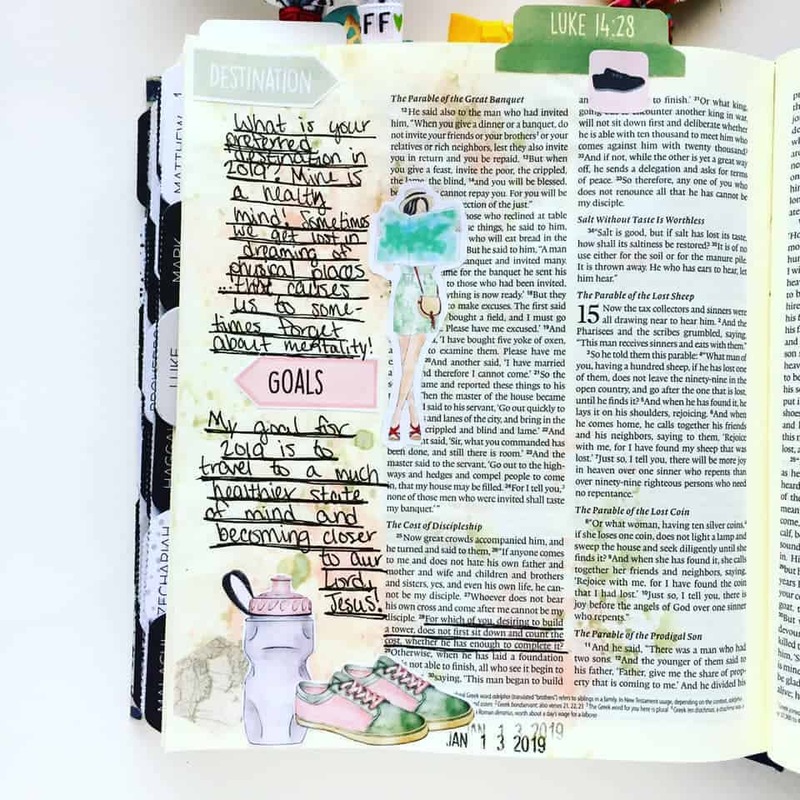 You can Bible journal and grow in your faith even if you only have five minutes! 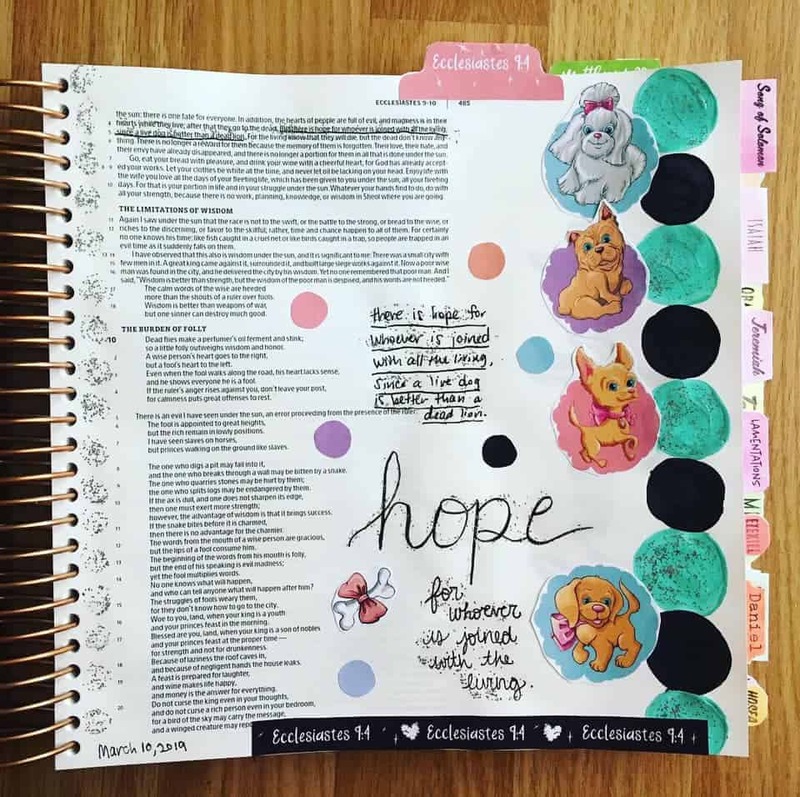 The next time you feel hopelessness strike, try writing out your favorite scriptures in a Bible journal. Then, pause and spend some time meditating on the scripture that led to the beauty you created on the page. You can see what some of our members have created below using our monthly Momentum Kit. If you have any thoughts or questions, please join our social community. Immediately the Spirit drove him out into the wilderness. He was there in the wilderness forty days tempted by Satan. 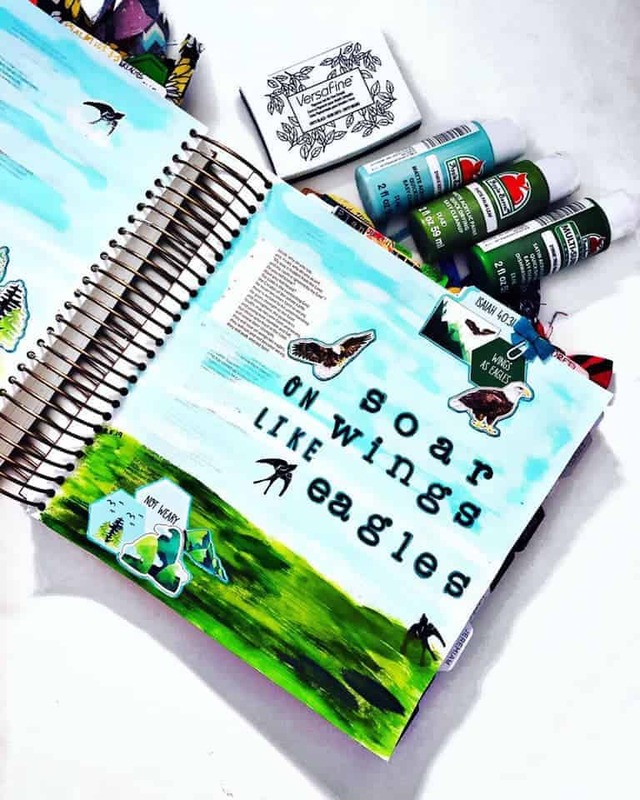 He was with the wild animals, and the angels were serving him.” This beautiful page was created by ‭‭Msedenika from the Creative Faith Crew using Scribble Sticks and Alpha Letters in her Illustrated Faith Bible, and cutouts from our monthly Momentum Kit. Those who fear you will see me and be glad because I have put my hope in your word. 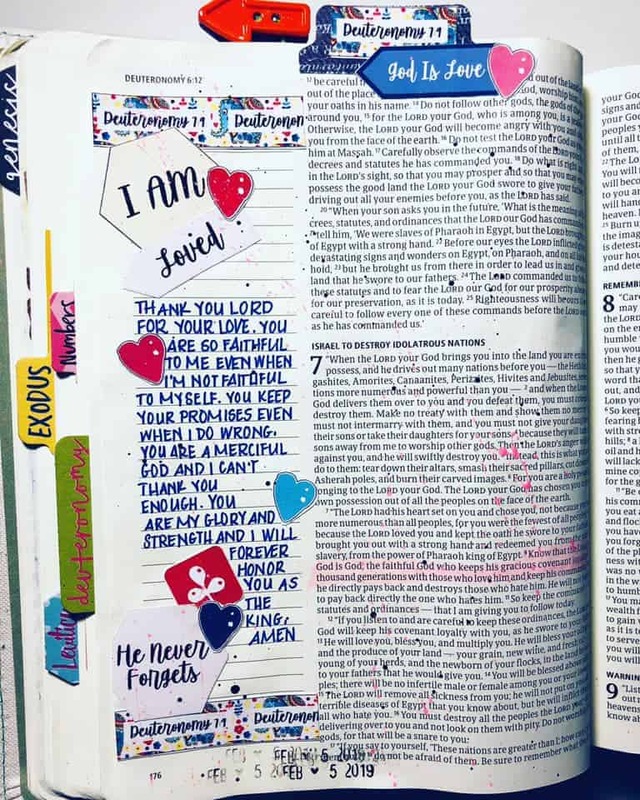 This page was created by Missy from our Creative Faith Crew using watercolor, stamping with VersaFine ink, 0.65 Illustrated Faith pen, and finished with washi tape in her Inspire Bible. Super cute! In his name, the nations will put their hope. 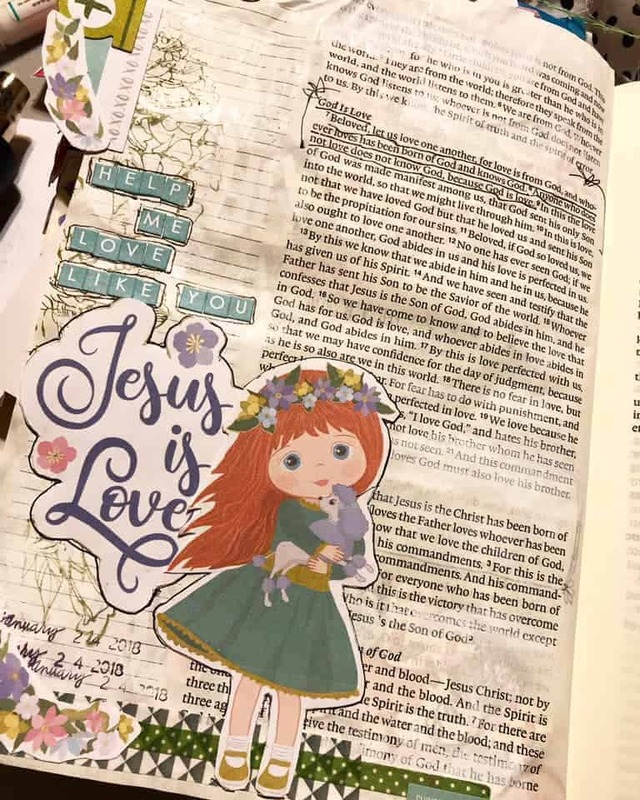 I created this page using this months Momentum Kit’s printables and foil using the Heat Wave tool, in my NIV Journal the World Bible Journal. Super cute! Know therefore that the Lord your God is God; he is the faithful God, keeping his covenant of love to a thousand generations of those who love him and keep his commandments. 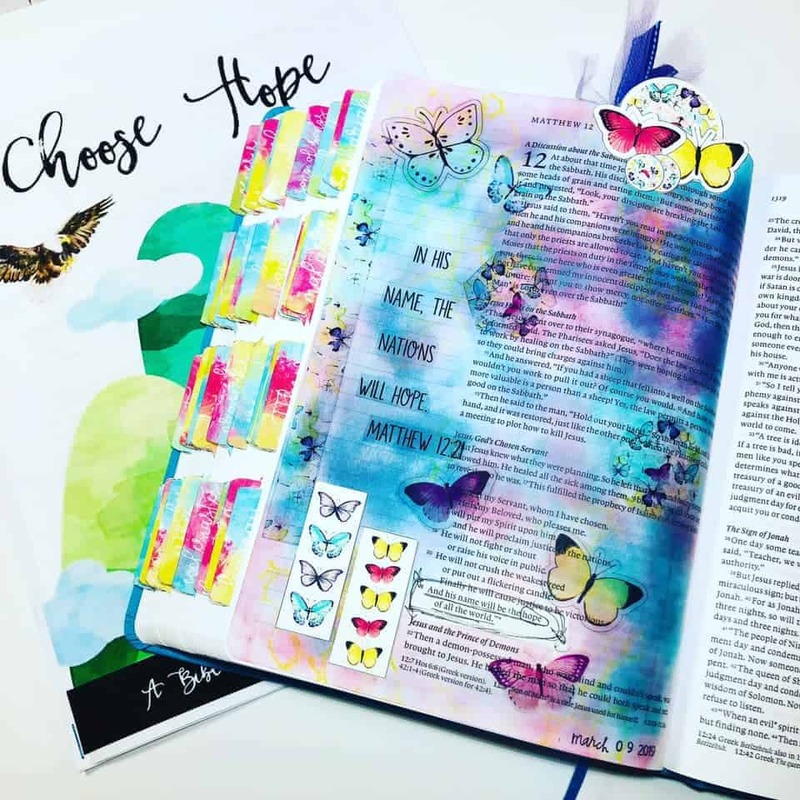 Taylor created this page with printables from our latest Momentum Subscription, distressed inks, and washi tape in her Illustrated Faith Bible journaling Bible. Preparing for Lent is always something I look forward to- Lent begins on Ash Wednesday which is tomorrow and lasts approximately six weeks later, before Easter Sunday. Lent is the preparation of the believer for Easter through prayer, doing penance, repentance of sins almsgiving, and self-denial. I use this time of year to reflect and reevaluate what is most important in my life and use this time to change it. Thank you, Mary, for this lovely page! 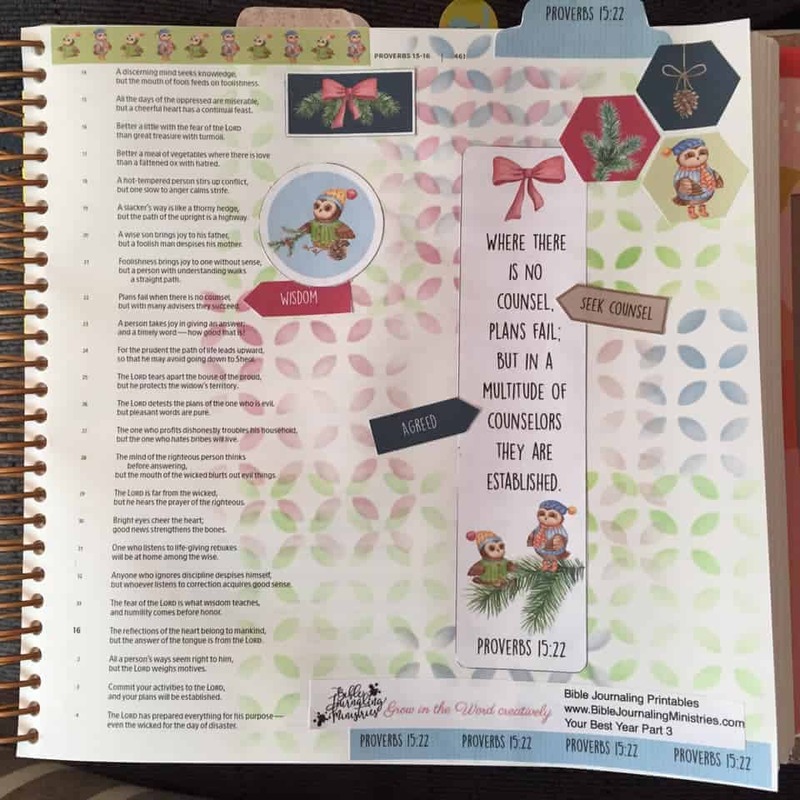 She used cutouts from our monthly Momentum Kit in her Illustrating Bible and we love it! But those who wait for Yahweh will renew their strength. watching your power and your glory. 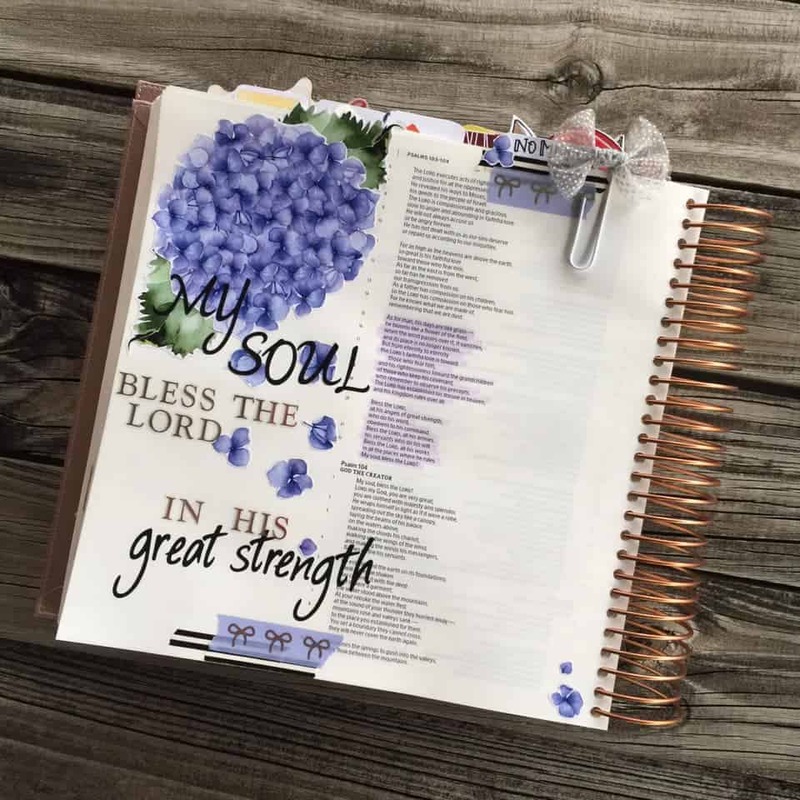 A huge thanks to Mary who created this page using this month’s Momentum printables in her Illustrated Faith Bible journaling Bible. Super cute! For which of you, desiring to build a tower, does not first sit down and count the cost, whether he has enough to complete it? Missy went back to the basics while creating this page. She used This page is back to the basics. 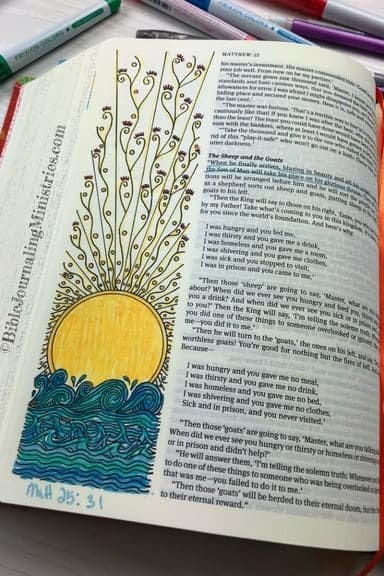 Just some gel pens, colored pencils, and some Bible Journaling Ministries printables. Cute and simple! Don’t store up for yourselves treasures on earth, where moth and rust destroy and where thieves break in and steal. But store up for yourselves treasures in heaven, where neither moth nor rust destroys, and where thieves don’t break in and steal. For where your treasure is, there your heart will be also. 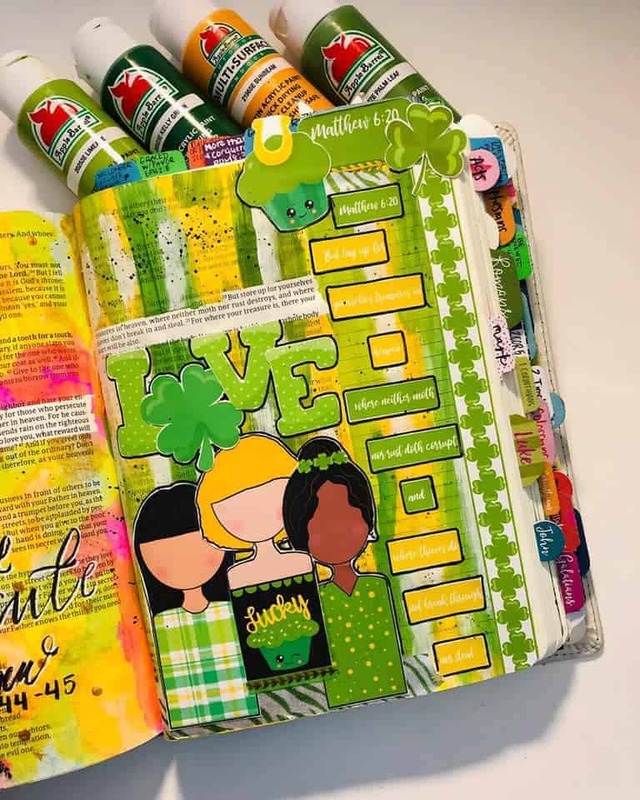 Msendenika from the Creative Faith Crew creathed this awesome page using acrylics, BIble Journaling Ministries printables, in her CSB notetaking Bible. “ Having hope will give you courage. So much to learn from the book of Job. About strength, courage, defeat, perseverance….all in the name of the Lord. Where does your strength come from???? Special thank you to Amanda from our Creative Faith Crew for making this page! She used gelatos and this month’s cut-outs from our monthly momentum subscription. And we are loving it!! As a follower of Jesus, confidence goes beyond self-assurance. It’s rooted in what God has done for you, rather than what you have achieved. You don’t need to progress to the highest ranks in your career or have thousands of wins in your corner to win have confidence. Confidence can be achieved by knowing what God has done for you, and focusing your efforts on the things that bring Him glory. Huge thank you to Nikki Bunch from our Creative Faith Crew for creating this page. 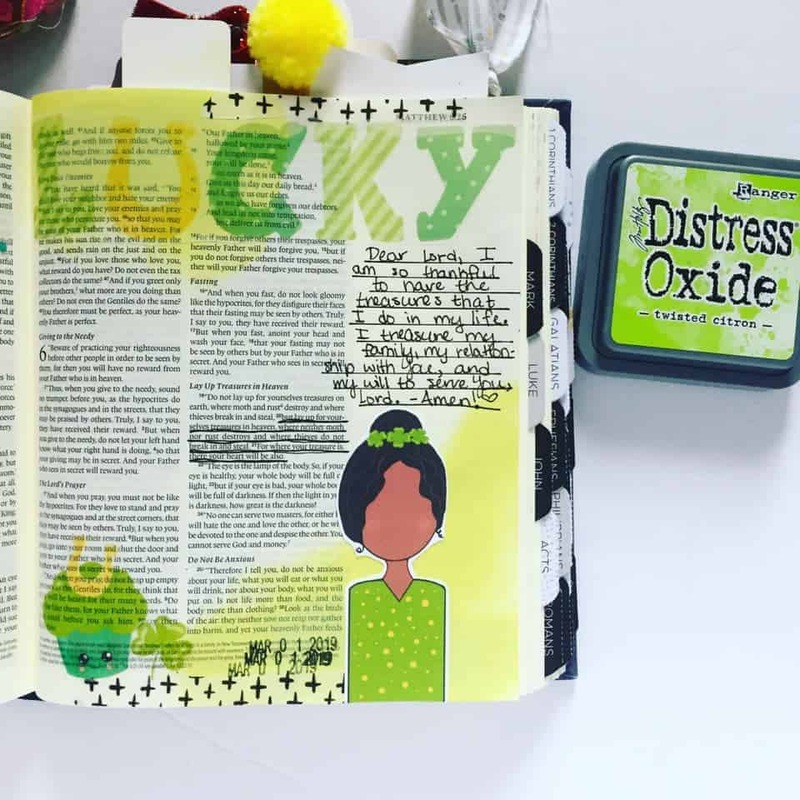 She used distressed inks with a stencil for the beautiful background and this month’s devotional printables! 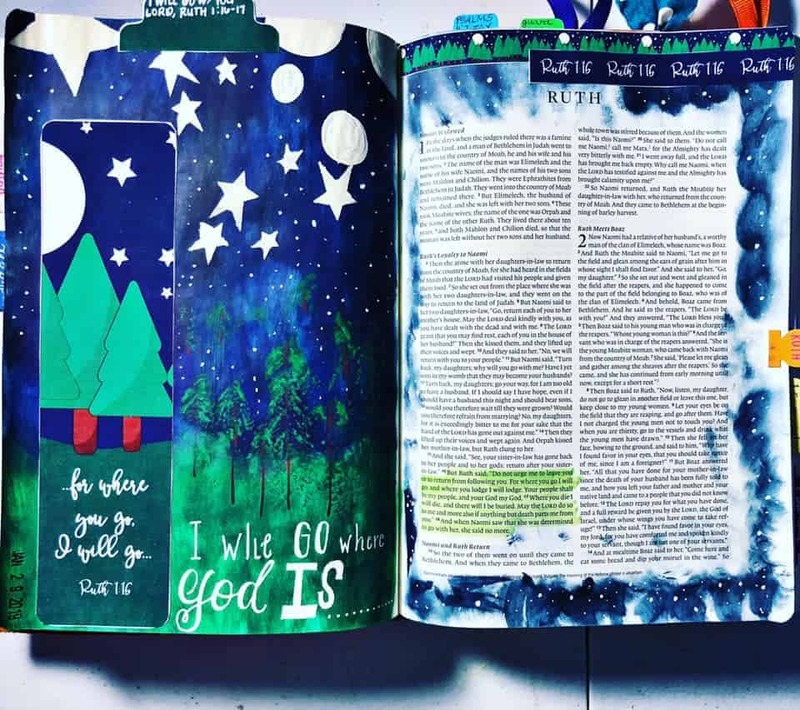 The wonderful thing about Bible Journaling is that it is completely up to you to decide what you want your pages to look like and the verses you want to focus on. 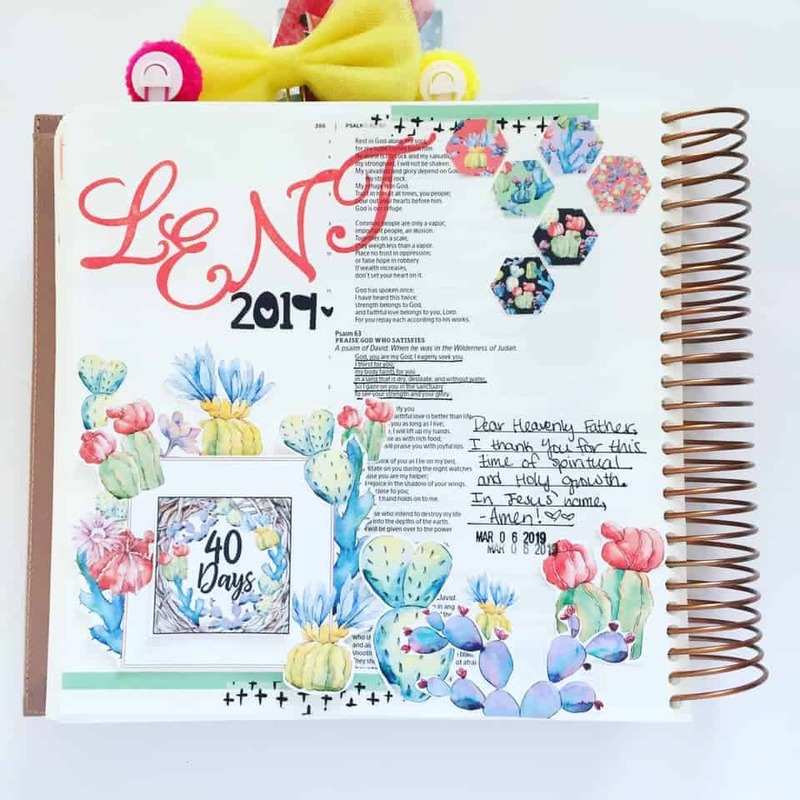 This can be a good thing and a bad thing depending on where you are on your Bible Journaling journey. We all hit a creative wall every now and then so it is important to just take a step back and look at your journal with fresh eyes and a refreshed heart. 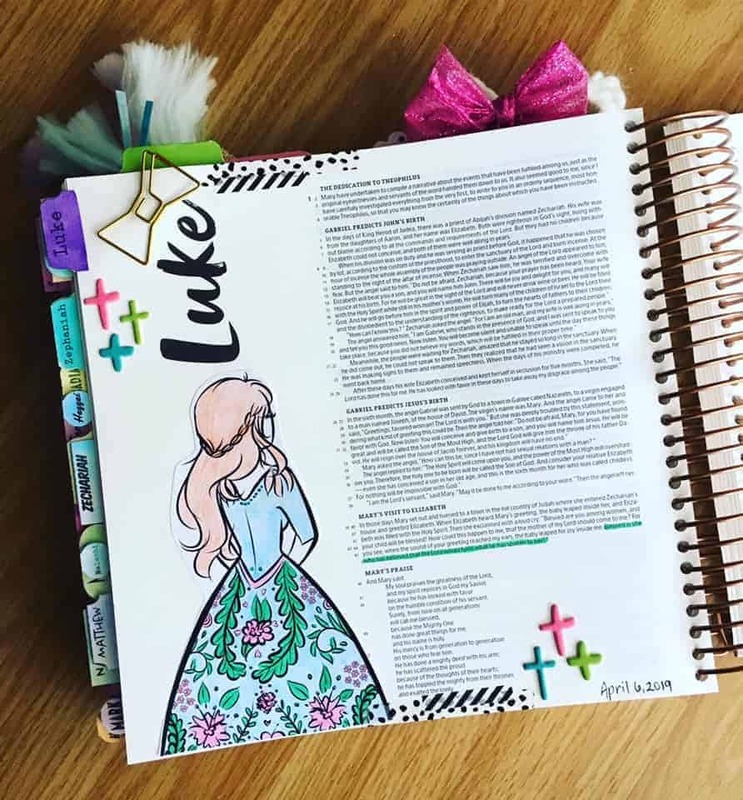 We are excited to share with you some Bible Journaling pages from our latest Momentum Subscription, and maybe it will help get your creative ideas moving. When hard pressed, I cried to the Lord; he brought me into a spacious place. The Lord is with me; I will not be afraid. What can mere mortals do to me? 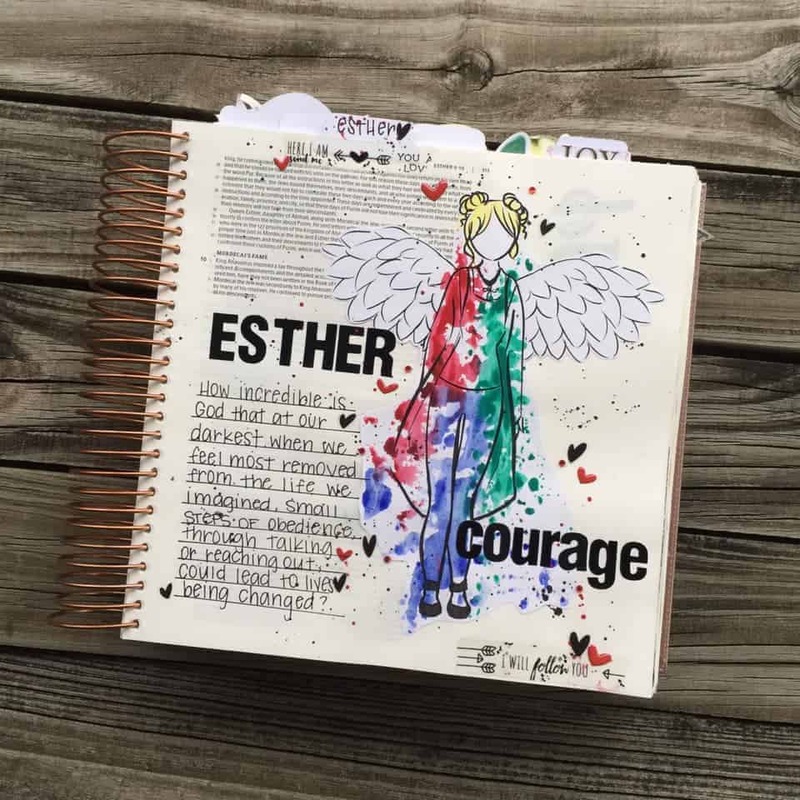 Aaron created this page using watercolor, white label paper, and a clip from FaithHeirLooms. Know therefore that the Lord your God is God; he is the faithful God, keeping his covenant of love to a thousand generations of those who love him and keep his commandments. 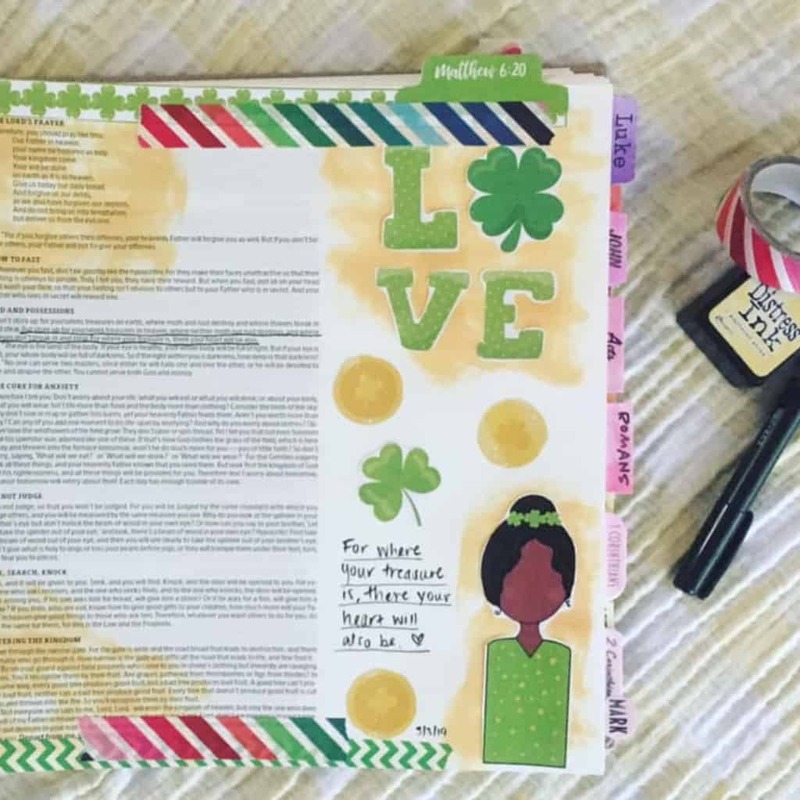 Taylor created this page with printables from our latest Momentum Subscription and watercolors. This is an ESV single column journaling bible. And in the wilderness. 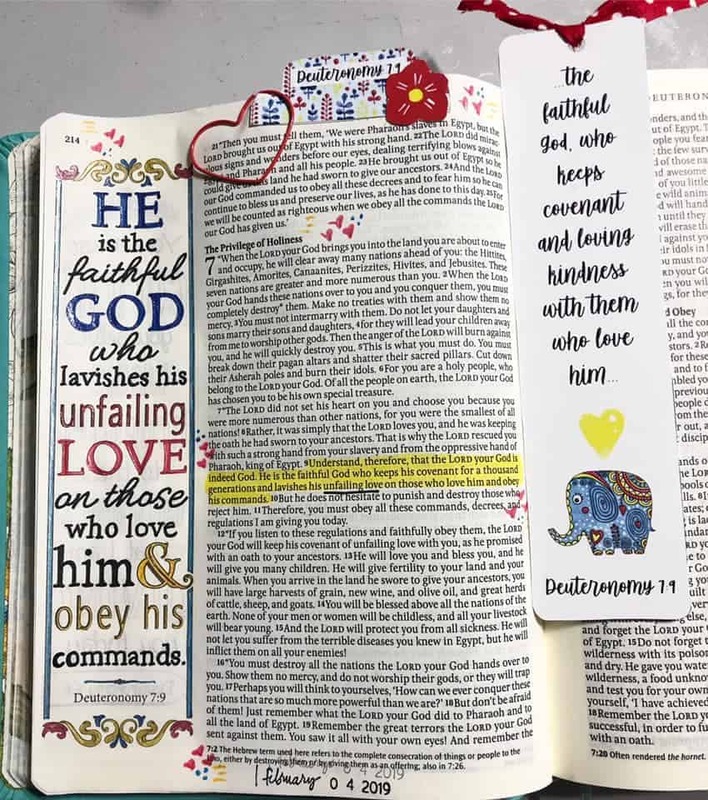 There you saw how the Lord your God carried you, as a father carries his son, all the way you went until you reached this place.” This page was created by Nikki from our CFC crew using printables & gelatos to make art marks. Super cute! Know therefore that the Lord your God is God; he is the faithful God, keeping his covenant of love to a thousand generations of those who love him and keep his commandments. 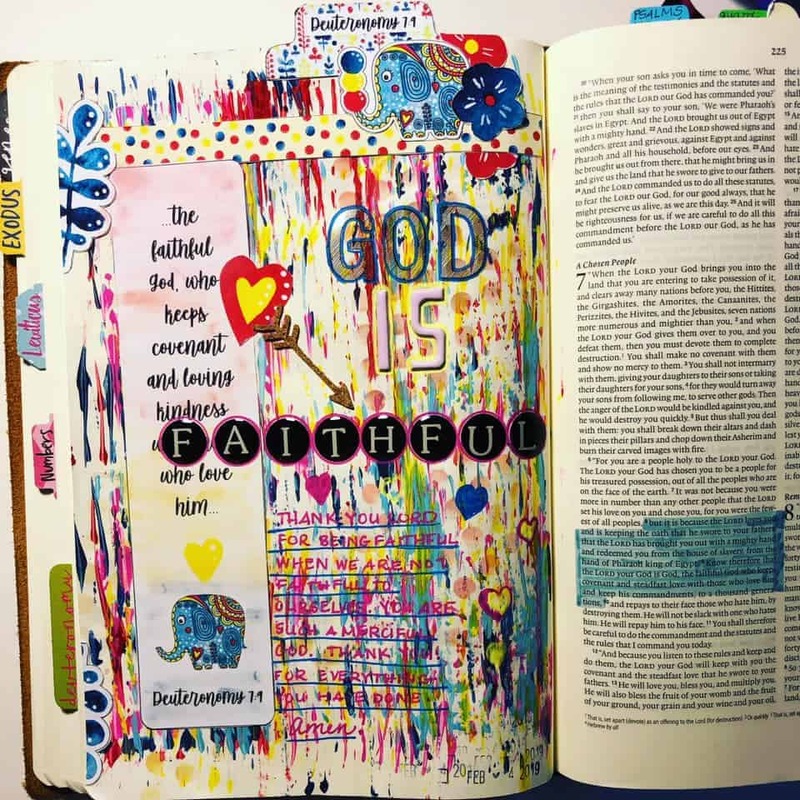 Msdenika created the page below in her CSB notetaking Bible using acrylics for the splatters. “How incredible is God that at our darkest when we feel most removed from the life we imagined, small steps of obedience through talking or reaching out could lead to lives being changed?” Thanks to Aaron for this great page and what great meaning behind it! 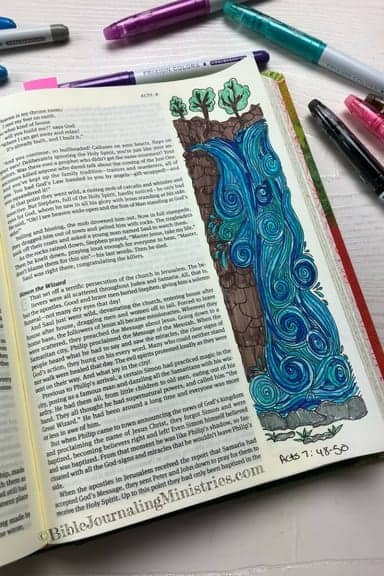 She used watercolors and stamps onyx ink in her IF Bible. For this reason I kneel before the Father, from whom every family in heaven and on earth derives its name. I pray that out of his glorious riches he may strengthen you with power through his Spirit in your inner being, so that Christ may dwell in your hearts through faith. And I pray that you, being rooted and established in love, may have power, together with all the Lord’s holy people, to grasp how wide and long and high and deep is the love of Christ, and to know this love that surpasses knowledge—that you may be filled to the measure of all the fullness of God. Msdenika created this page using her illustrating bible, distress oxide ink, and vellum by recollections. We love it! Know therefore that the Lord your God is God; he is the faithful God, keeping his covenant of love to a thousand generations of those who love him and keep his commandments. 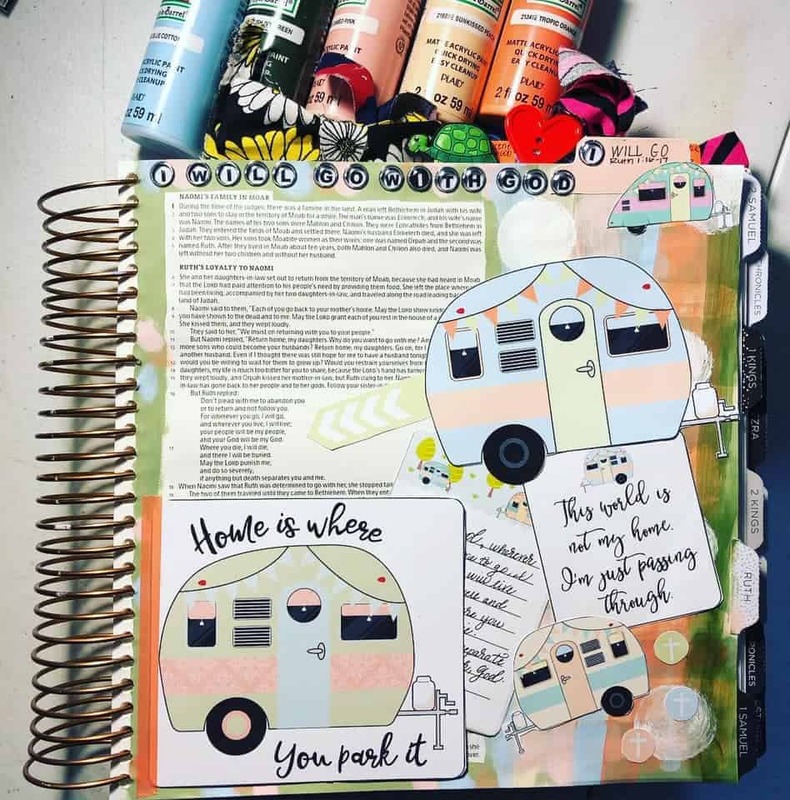 This page was created by Nikki using distress ink for the background & the printables from the latest subscription kit. Give thanks to the Lord, for he is good. His love endures forever. Missy created this page in her Tyndale House Publishers Inspire Bible brought together with @primamarketinginc spring & fall watercolor pencils, the January kit stamps from Illustrated Faith with DaySpring, some Ranger Ink distress oxide ink, and my favorite Lawn Fawn jet black ink…then finished off with a Heidi Swapp date stamp and some prayer journaling with my favorite Illustrated Faith pens. See what great love the Father has lavished on us, that we should be called children of God! And that is what we are! The reason the world does not know us is that it did not know him. A huge thank you Aaron who created this page, it looks great! Give thanks to the Lord, for he is good.His love endures forever. 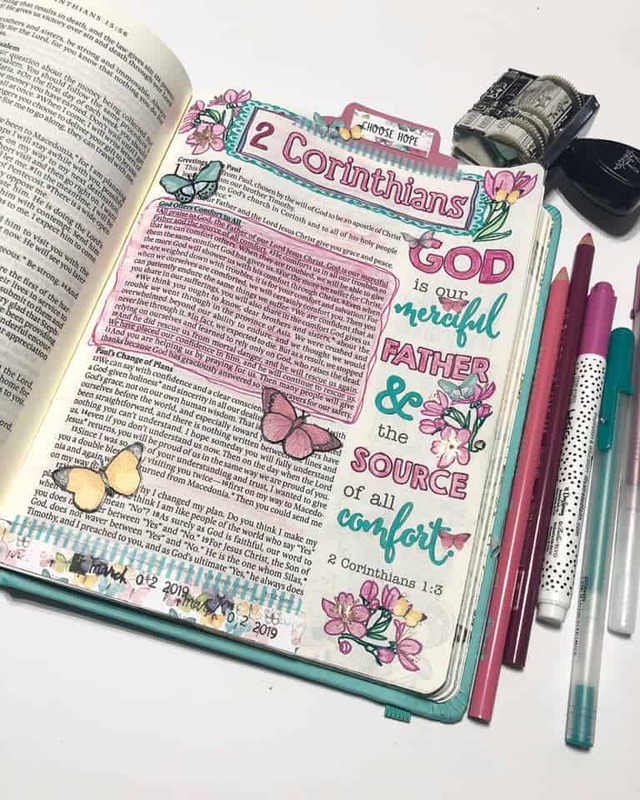 Msdenika created the pages below using an interleaved journaling bible, distress oxide ink, floral stamps from and official chalk ink. But God demonstrates his own love for us in this: While we were still sinners, Christ died for us. This page was created by Nikki using distressed inks and printables from our latest Momentum subscription. For now we see only a reflection as in a mirror; then we shall see face to face. Now I know in part; then I shall know fully, even as I am fully known And now these three remain: faith, hope and love. But the greatest of these is love. 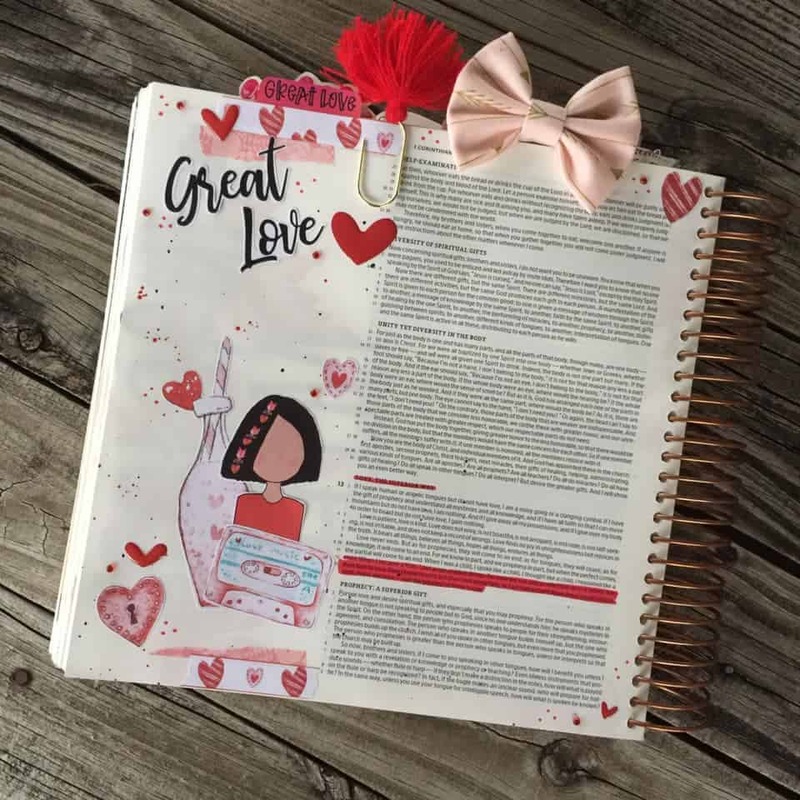 Aaron created this page using the theme for Valentine’s Day and it is darn cute! I will betroth you to me forever; I will betroth you in righteousness and justice, in love and compassion. Amanda, from our CFC crew created this adorable page using materials from our last kit. Adorable! 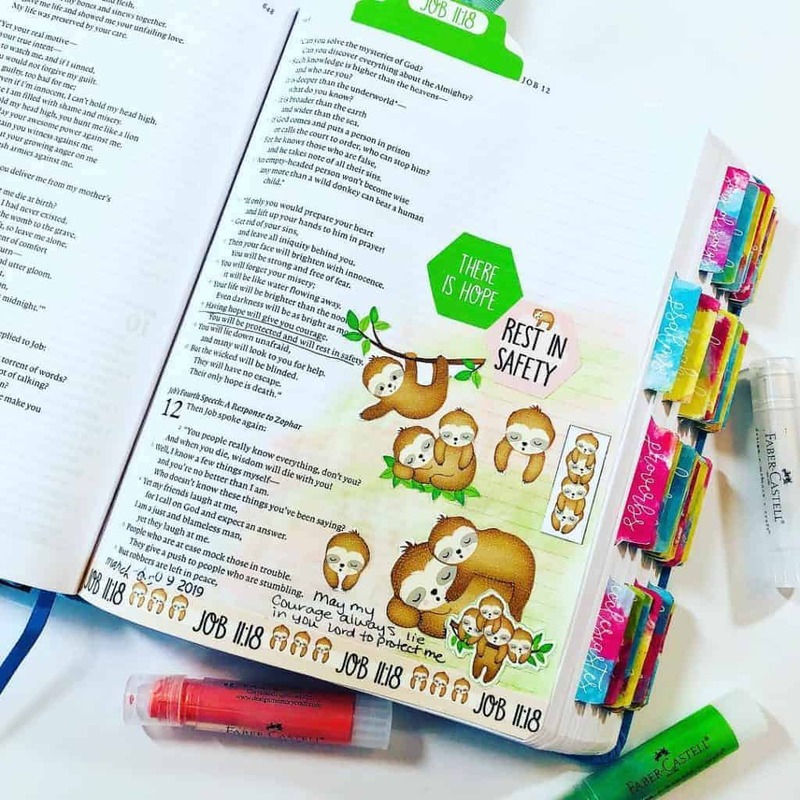 This planner from Choosetodo, was created by Aaron from our Creative Faith Crew using stickers from a few different sources, but how cute is this to keep you on track for your Bible Journaling? As a prisoner for the Lord, then, I urge you to live a life worthy of the calling you have received. Be completely humble and gentle; be patient, bearing with one another in love. Make every effort to keep the unity of the Spirit through the bond of peace. 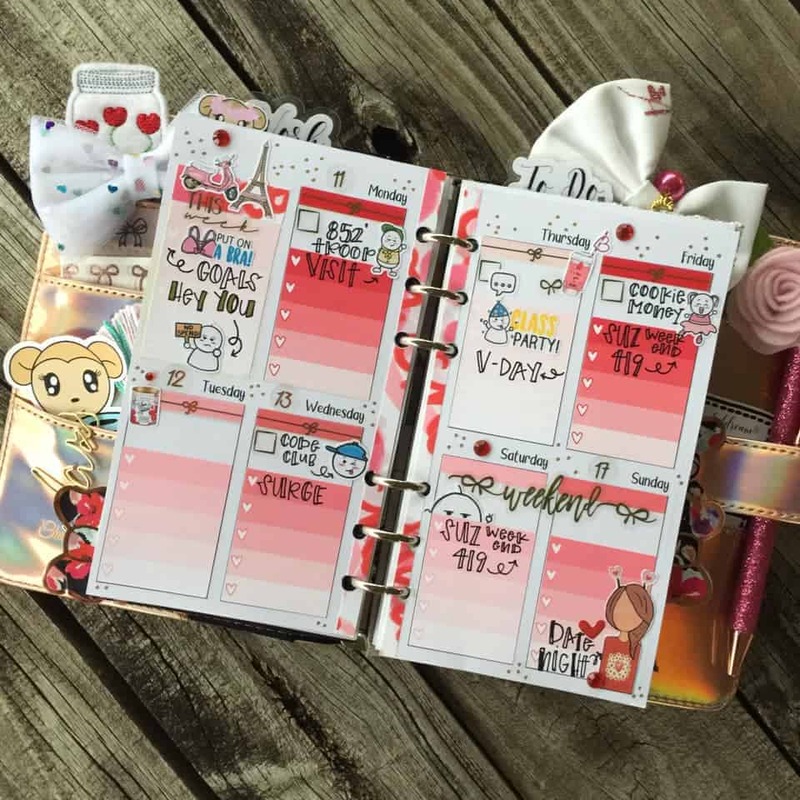 Nikki create this page by putting the printables from our last kit on clear sticky paper. The result is adorable! What is the most beautiful thing you’ve ever seen? What did you say when you saw it? Sometimes, people don’t know what to say when they see something beautiful. Some people say “Wow!” Other people might say “Whoa!” or “I can’t believe it!” Sometimes they just smile. 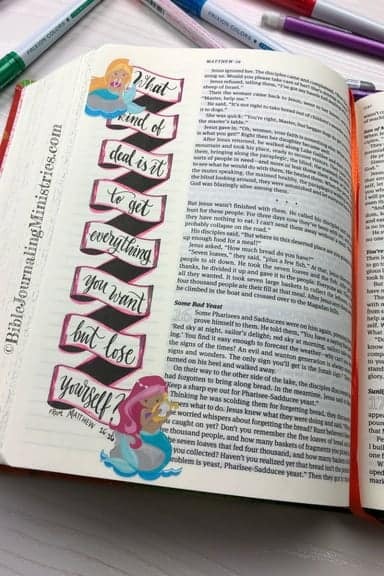 The Bible says that you are “fearfully and wonderfully made.” Aaron created this page by using the cute little horse printable from our last Momentum Kit. I will betroth you to me forever; I will betroth you in righteousness and justice, in love and compassion. 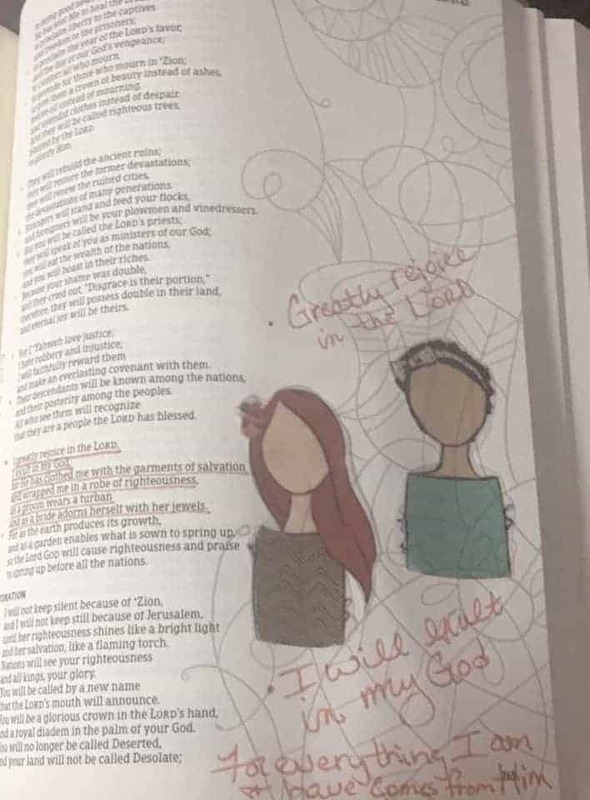 This page was created by Mary from our Creative Faith Crew and we love it! “The life of mortals is like grass, they flourish like a flower of the field; the wind blows over it and it is gone, and its place remembers it no more. But from everlasting to everlasting the Lord’s love is with those who fear him, and his righteousness with their children’s children—with those who keep his covenant and remember to obey his precepts…” Aaron created this page by using printables and stickers to give it a “spring” feel. Love it! There is a lot that can be said for someone who follows their heart. 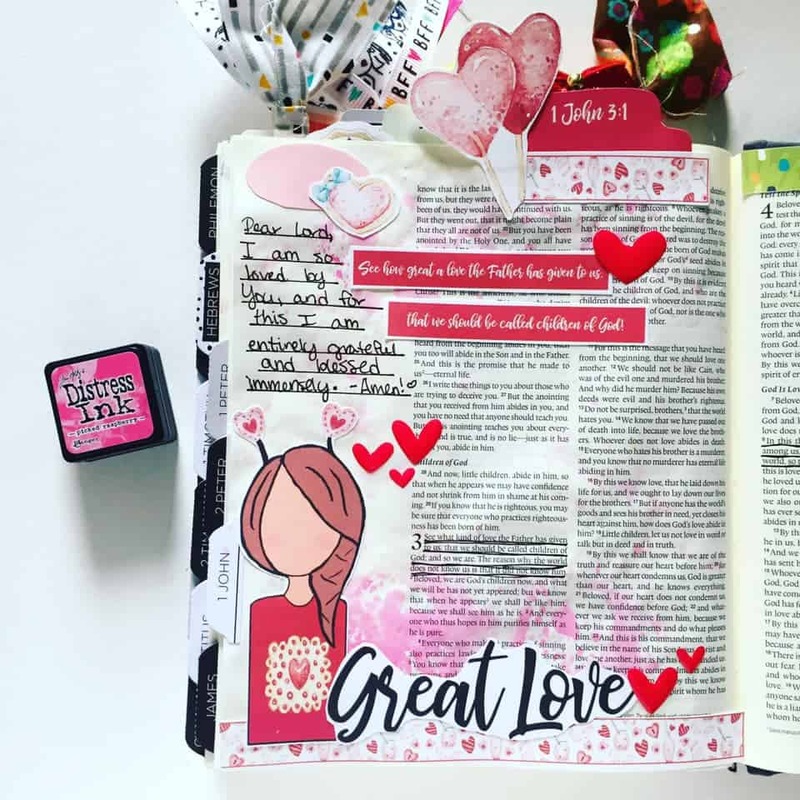 Even more so when you trust your heart to lead you to Bible journaling. 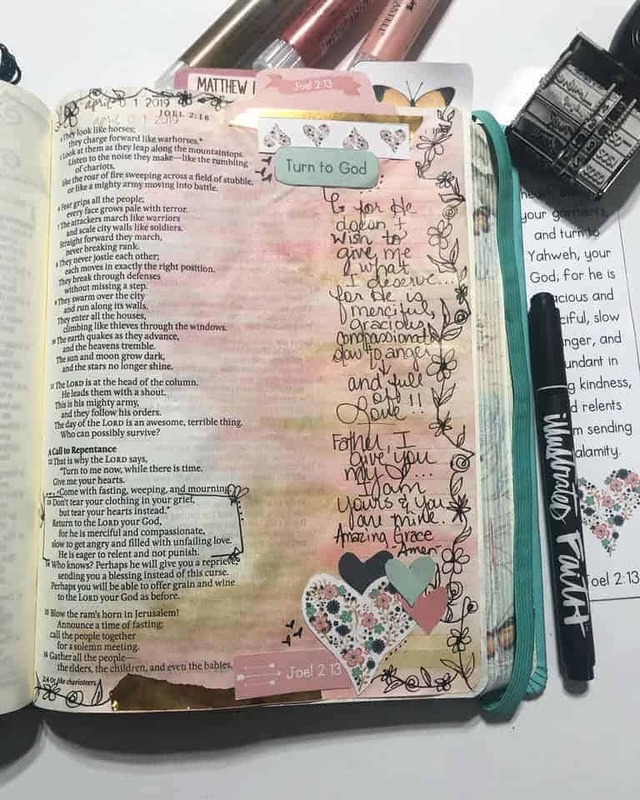 Bible journaling is not only a creative outlet, but also allows you to spend much needed quiet time with God. 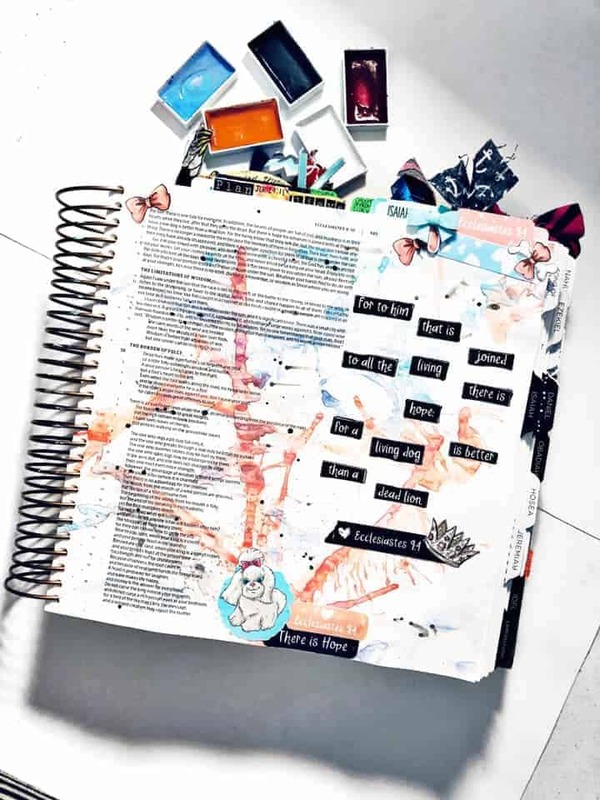 You don’t need to be an artist to create pages you will cherish forever, you just need to have the heart and some materials to get you started. 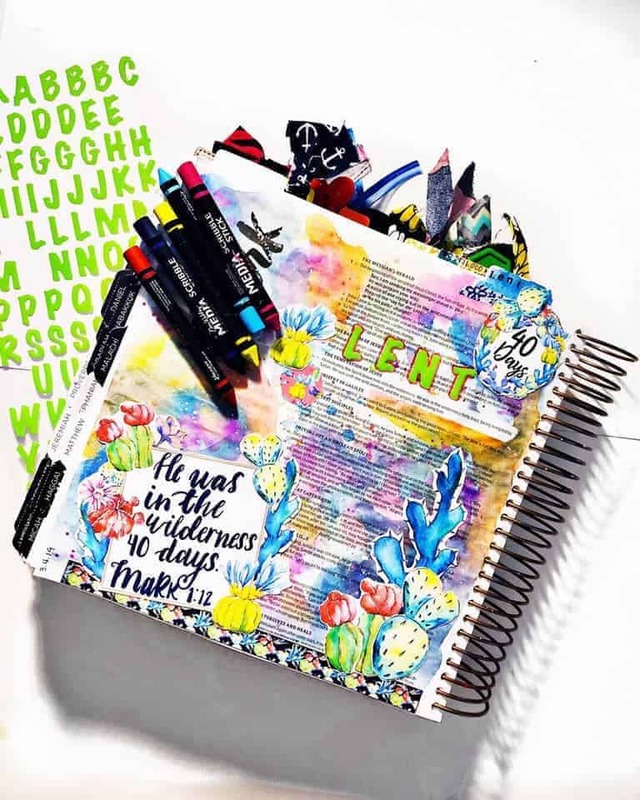 Bible Journaling Ministries makes it easy for you to get started by providing a monthly Momentum Subscription that can be used in any way you want. Some members from our Creative Faith Crew have some examples for you below. Check them out! “See what great love the Father has lavished on us, that we should be called children of God! And that is what we are! The reason the world does not know us is that it did not know him.” I created this page using stickers, acrylic paint, and a posca pen. How Cute! “Dear friends, let us love one another, for love comes from God. Everyone who loves has been born of God and knows God. Whoever does not love does not know God, because God is love. 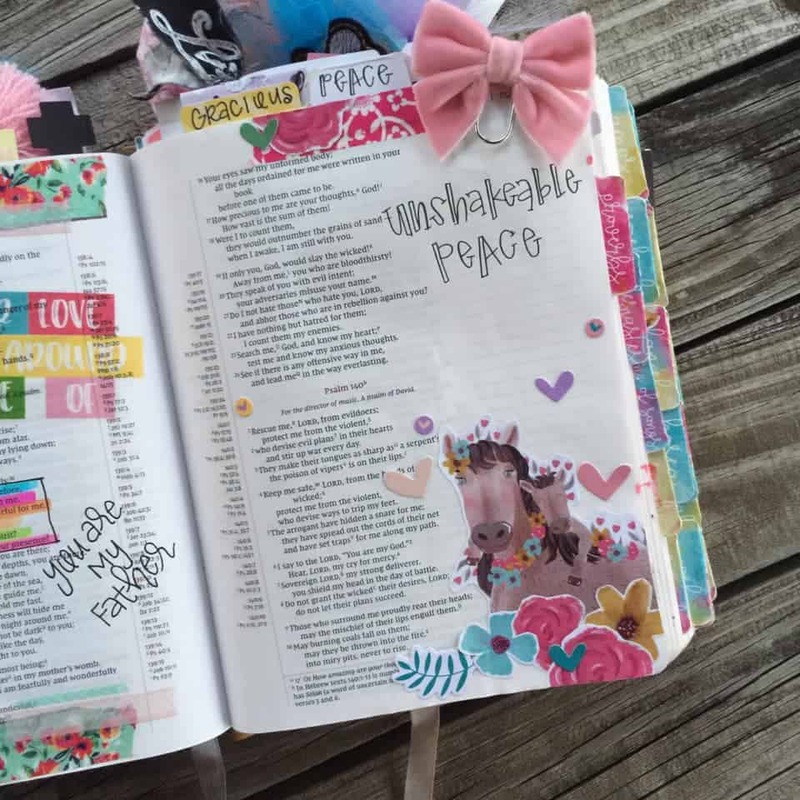 ” This page was created by Missy from our Creative Faith Crew by using the adorable printable from one of Bible Journaling Ministries new sets. “But Ruth replied, “Don’t urge me to leave you or to turn back from you. Where you go I will go, and where you stay I will stay. Your people will be my people and your God my God. 17 Where you die I will die, and there I will be buried. May the Lord deal with me, be it ever so severely, if even death separates you and me.” ” MseDenika created this page using simple acrylic paint (admiral blue, new shamrock, Christmas tree green, nutmeg and antique white)! “See what great love the Father has lavished on us, that we should be called children of God! And that is what we are! The reason the world does not know us is that it did not know him. ” A huge thanks to Mary who created this page. “But Ruth replied, “Don’t urge me to leave you or to turn back from you. Where you go I will go, and where you stay I will stay. Your people will be my people and your God my God. Where you die I will die, and there I will be buried. May the Lord deal with me, be it ever so severely, if even death separates you and me.” ” MseDenika created this page using simple acrylic paint and printouts from our Momentum Subscription. “See what great love the Father has lavished on us, that we should be called children of God! And that is what we are! 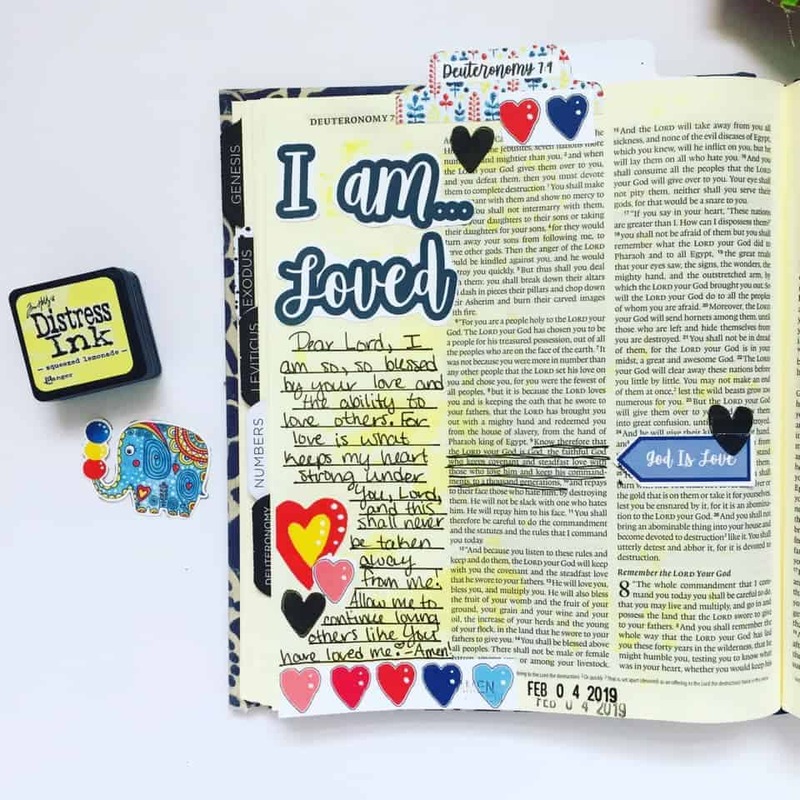 The reason the world does not know us is that it did not know him.” Nikki created this page using Bible Journaling Ministries printables and distressed ink. How adorable for the month of February! “But God demonstrates his own love for us in this: While we were still sinners, Christ died for us.” Msedenika created this page using the following products: Illustrating Bible, apple barrel acrylics (wintergreen, black, honeysuckle, wild iris, and tapestry wine), wet and wild cosmetic brush. “Know therefore that the Lord your God is God; he is the faithful God, keeping his covenant of love to a thousand generations of those who love him and keep his commandments. 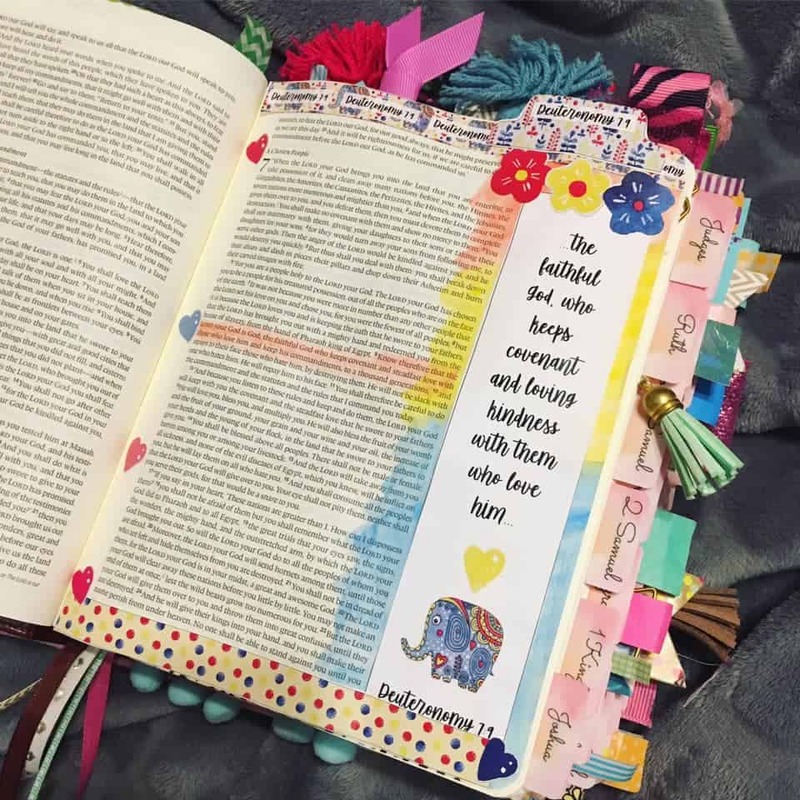 ” Bible Journaling shouldn’t be hard or complicated. It is about the process…thinking about the scripture and spending time with God. 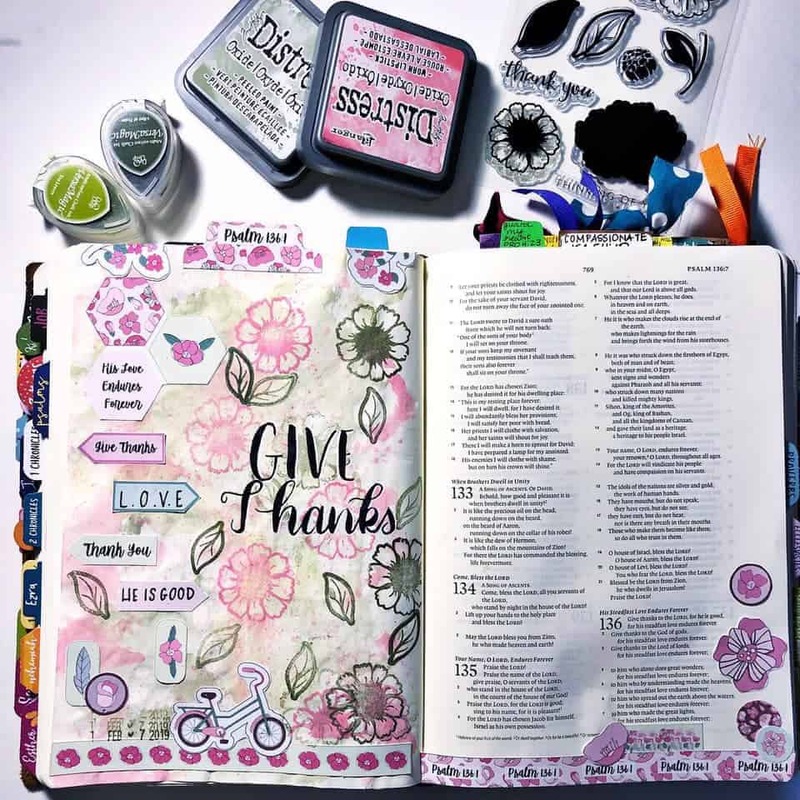 This simple page was created using an Inspire Bible, Crafty Croc gel pens, and Bible Journaling Ministries momentum printables that came together quickly. Thanks to Missy for this page! “The Lord did not set his affection on you and choose you because you were more numerous than other peoples, for you were the fewest of all peoples. But it was because the Lord loved you and kept the oath he swore to your ancestors that he brought you out with a mighty hand and redeemed you from the land of slavery, from the power of Pharaoh king of Egypt. Know therefore that the Lord your God is God; he is the faithful God, keeping his covenant of love to a thousand generations of those who love him and keep his commandments.” Msedenika created this page within an interleaved journaling bible from Crossway, distress oxide ink for the tip in, and apple barrel acrylics). She used a technique where she cut a card in a pattern to get the acrylic to look striated. How cool! 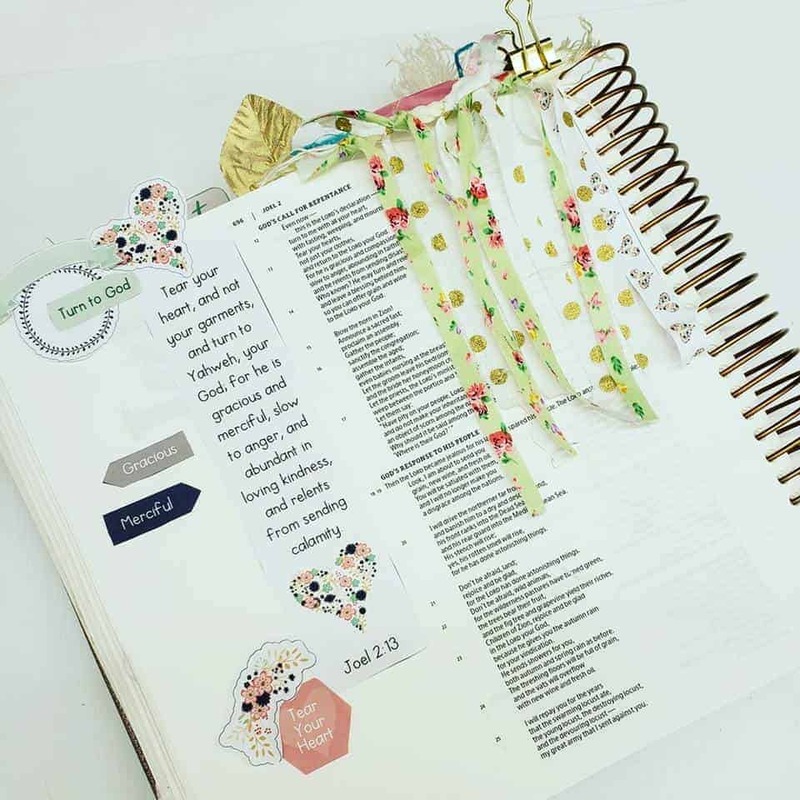 Are you looking for a little inspiration when it comes to your Bible journaling? Don’t worry, you aren’t alone! Our entire community is here for you to give ideas, advice, and of course fellowship in the Word. 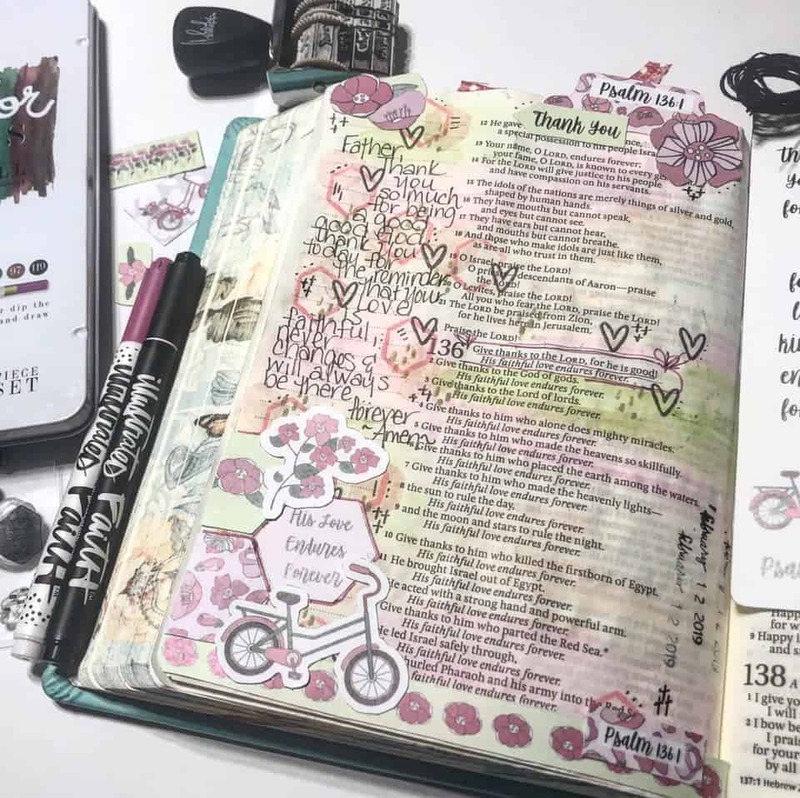 Proverbs 27:17 states, “As iron sharpens iron, so one person sharpens another.” This verse speaks perfectly to what Bible Journaling for Beginners is all about. If you have been waiting and looking for the right community to be a part to grow your faith, this is it. You can see what some of our members have created below using our monthly Momentum Kit. If you have any thoughts or questions, please join our social community. 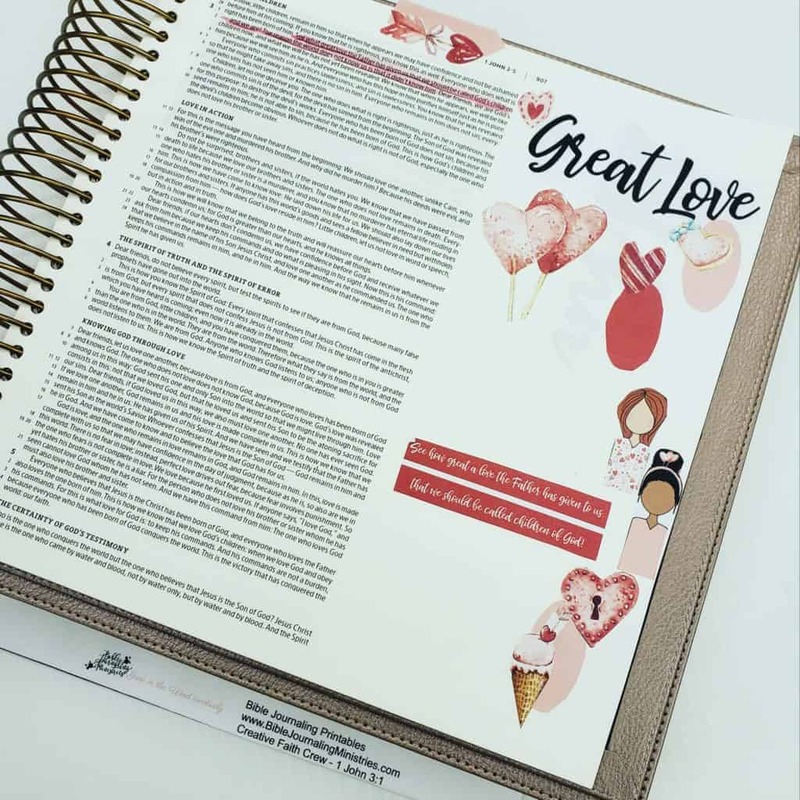 “Without counsel plans fail, but with many advisers they succeed.” This beautiful page was created by Nikki Bunch using distressed ink and cutouts from our monthly Momentum Kit. “I will greatly rejoice in the Lord; my soul shall exult in my God, for he has clothed me with the garments of salvation; he has covered me with the robe of righteousness, as a bridegroom decks himself like a priest with a beautiful headdress, and as a bride adorns herself with her jewels.” Joyce created this page with some cutouts and colored pencils. 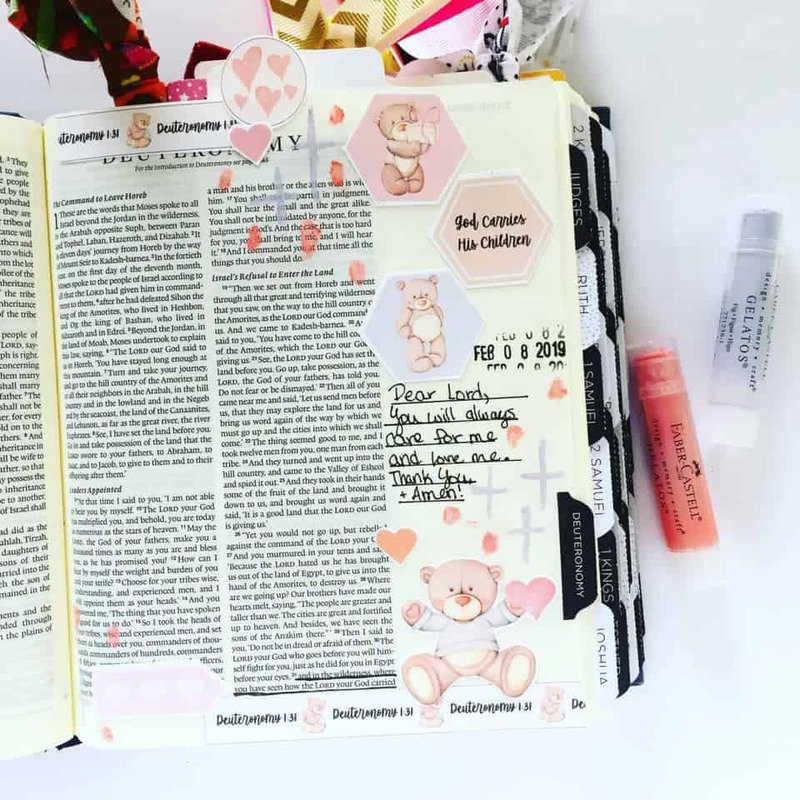 Anyone can be a Bible journaler! “For which of you, desiring to build a tower, does not first sit down and count the cost, whether he has enough to complete it?” Nikki Bunch, from our Creative Faith Crew created this page using distress inks to create the background & printables from Bible Journaling Ministries. 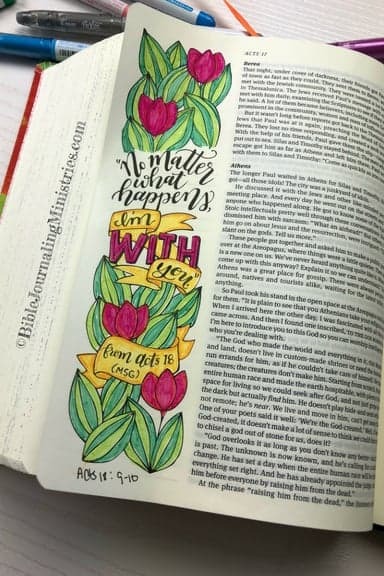 “I know that you can do all things, and that no purpose of yours can be thwarted.” This set by Bible Journaling Ministries is awesome. Especially the devotional content. “A map is useless without a destination.” Make sure you know where you’re going, then figure out how to get there. Thanks to Missy for this page! “For which of you, desiring to build a tower, does not first sit down and count the cost, whether he has enough to complete it?” Justine created this page using a few stamps, some glitter and buttons. Cute and simple! “Without counsel, plans go awry, But in the multitude of counselors they are established.” Rebecca created this page using almost all of the parts from the printable from Bible Journaling Ministries “Your Best Year Part 3.” First, she used a stencil from Wal-Mart, then added Colorbox ink pad in Doodlebug colors using a Tim Holtz mini blending tool. How cool! 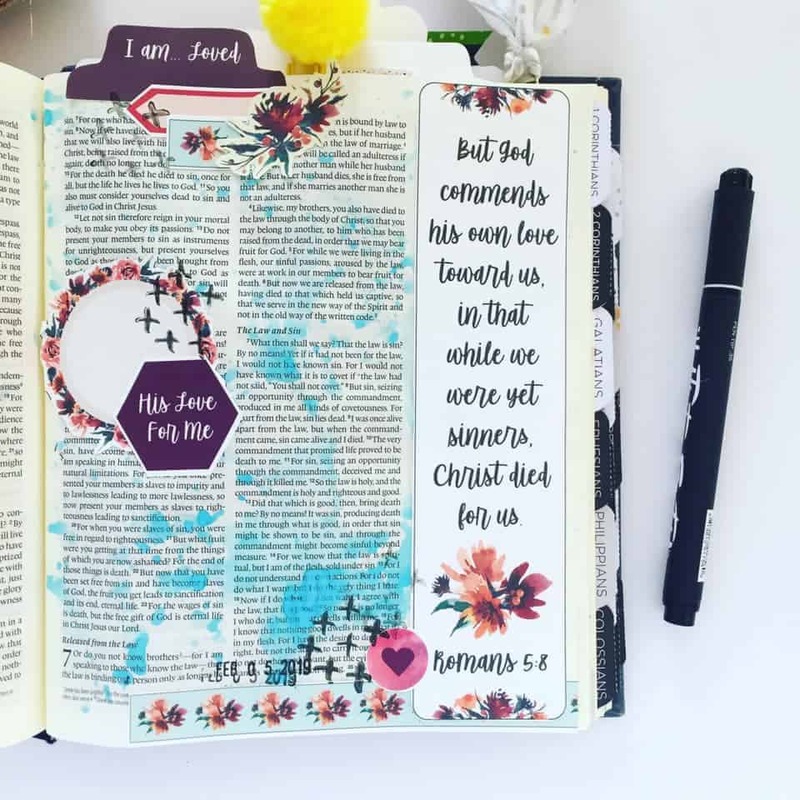 “To the praise of his glorious grace, with which he has blessed us in the Beloved.” Nikki created this page using distressed inks to create the background, some washi tape from Hobby Lobby, & printables from Bible Journaling Ministries. “The Lord will always lead you, satisfy you in a parched land, and strengthen your bones. 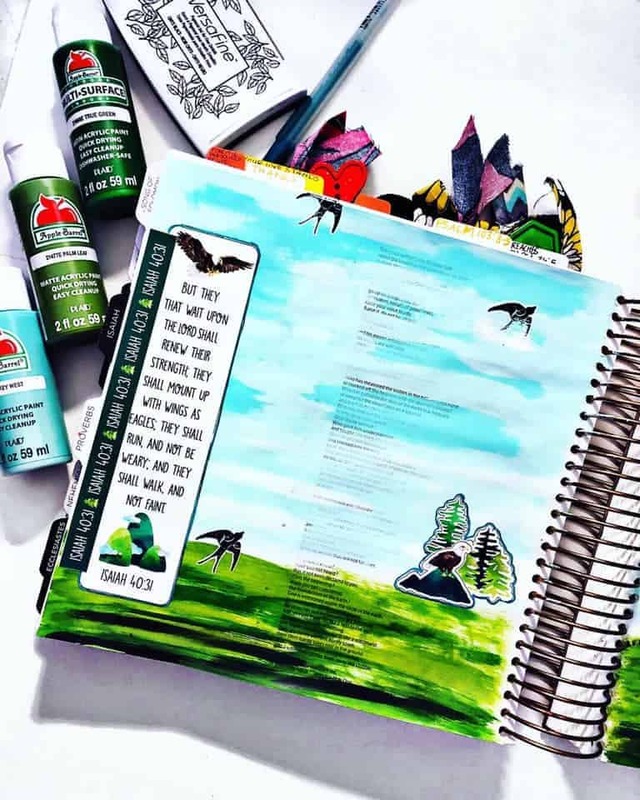 You will be like a watered garden and like a spring whose water never runs dry.” Rebecca, from our Creative Faith Crew, created this post using a Daniel Smith watercolor dot card (the 66 count.) Then added the printable with a few pieces of washi tape. This printable comes from the most recent subscription to Bible Journaling Ministries. This one is called “Your Best Year Part 4”. 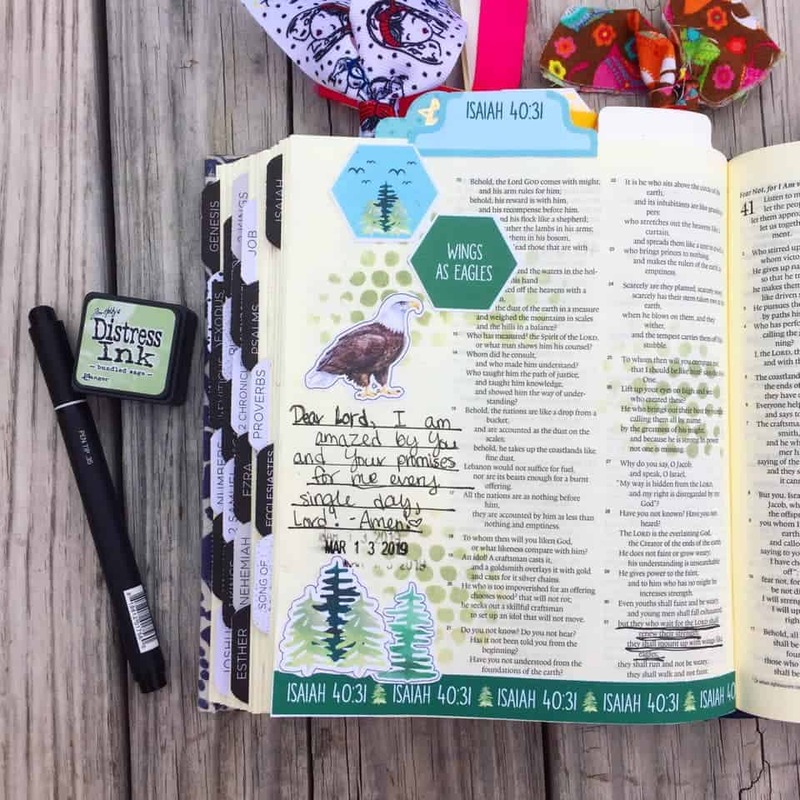 Searching for the perfect no-bleed pens for Bible journaling? I’m with ya! I’ve been longing for a great pen or marker that doesn’t bleed through thin Bible pages. In fact, I was over-the-moon excited when a friend of mine introduced me to the Pilot Frixion pen the other day. I was so excited that I placed an Amazon order immediately and they arrived at my house that very same day. I ripped opened up the bag and tested the pens in my Bible and they worked perfectly! They didn’t bleed through my thin Bible pages and they also erased with ease. It’s like magic! Except, it’s not magic. It’s a chemical reaction that causes the change in color. 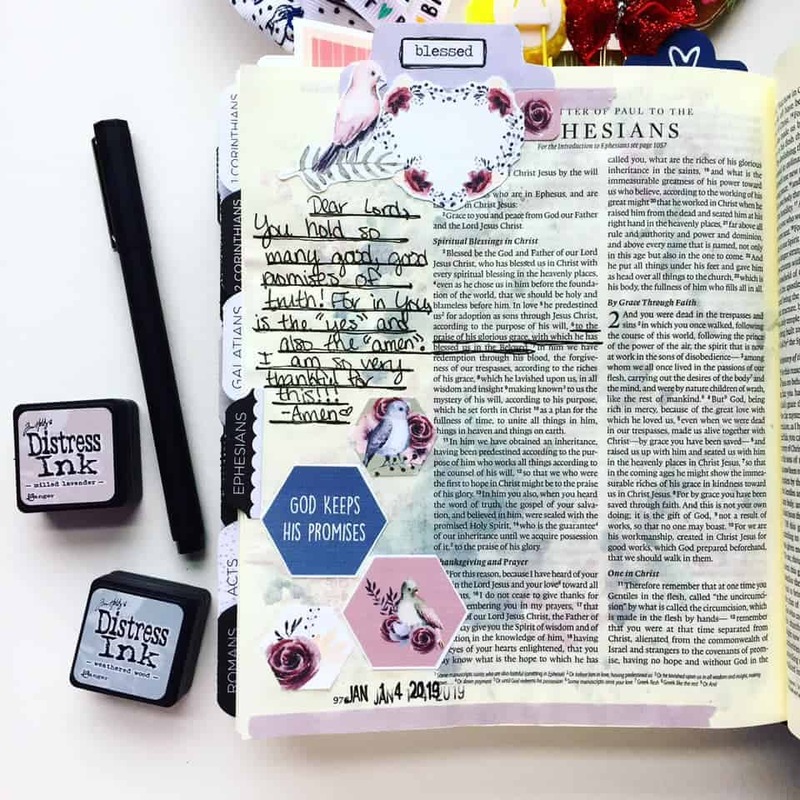 Are No-bleed Pens Good for Bible Journaling? Disappearing Ink: The ink will disappear at temperatures of 140 degrees or higher. But don’t worry, you can put your Bible in the Freezer and bring back the color effortlessly. The upside to this is that you can write something in your Bible that you don’t want others to read. Overall, I don’t recommend using these pens in your Bible. Ulitmately, the choice is yours. If you prefer them and don’t mind that they’re not archival, then by all means, use them. My favorite no-bleed pens for Bible journaling are actually paint markers. They’re called Posca Pens and are basically acrylic paint in a pen. They work well and rarely bleed through. My second favorite no-bleed pens for Bible journaling are gel pens. The gel allows them to stay on top of the page rather than soak into the page. However, I have had them bleed through the page. 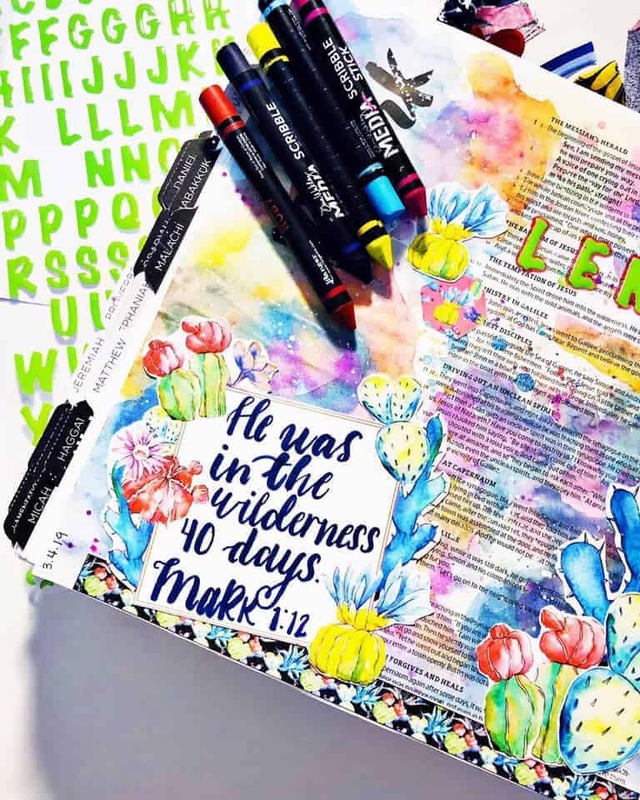 Here are a few of the examples of Bible journaling with no-bleed pens. “Keep listening to my words, and let this be your comfort. And after my skin has been thus destroyed, yet in my flesh I shall see God. 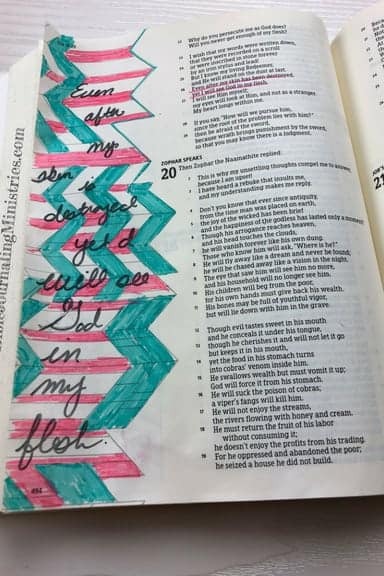 The decision to use Pilot Frixion pens in your Bible is yours to make. I think that I’ll skip them and pass the pens onto my kids. Perhaps they’ll find creative uses for them beside passing notes in class. Hopefully not in their planner since we’re in Arizona and it gets hot here. We don’t want them to miss any appointments due to dissapearing ink! What are other uses for these pens? I’d love to know in the comments below! 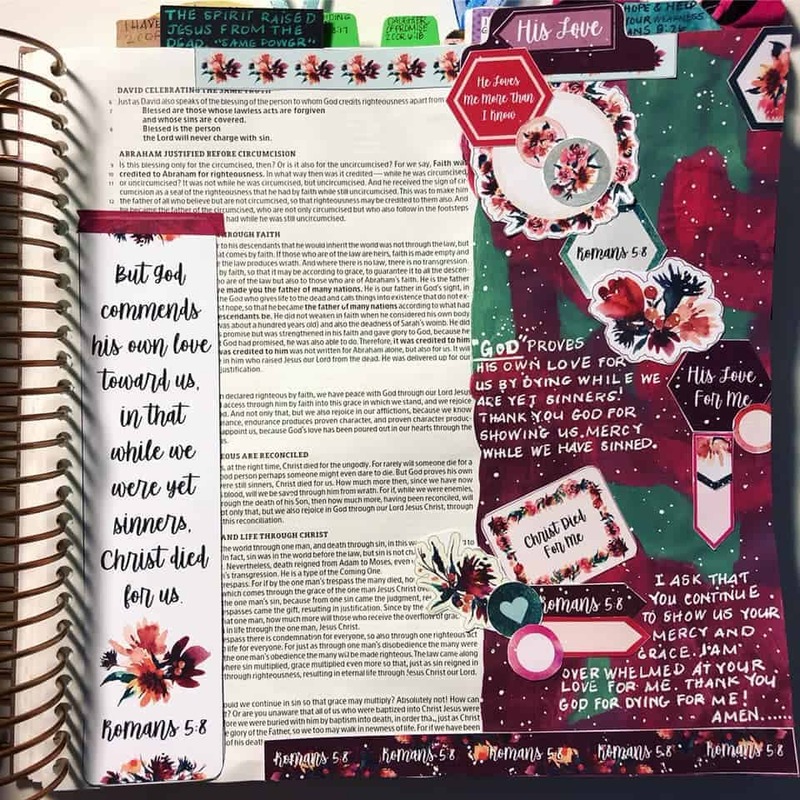 The Bible journaling quick kit is our latest digital download that’s designed to help you create a beautiful layered look in just minutes. To get started using quick kits, you need our kits and access to a printer. If you don’t have a printer, you can also go to any print shop and have them print them out for you. If you’re concerned about printer ink, just print the page you want or sign up for HP Instant Ink. Here’s my referral link to learn more. I LOVE THIS PROGRAM!!! I’m on the 300 pages per month for $9.99 deal, but they have plans starting at $2.99! Apparently, by being in this program I save $672 per year in printer ink. Wow. I believe that number is accurate, but even if it’s 50% overinflated, I’m still saving over $300 per year. My Cup OverflowsQuick Kit – Click here to purchase. Die cut machine – Click here to learn how to use the Cricut, Silhouette, or Brother machines to make stickers. To assemble the kit, print it out and cut it. Then layer the red piece over the black piece using glue or sticker sheets. Finish it up with layering the banners, rivets, and cup. Here’s a quick video showing the process. 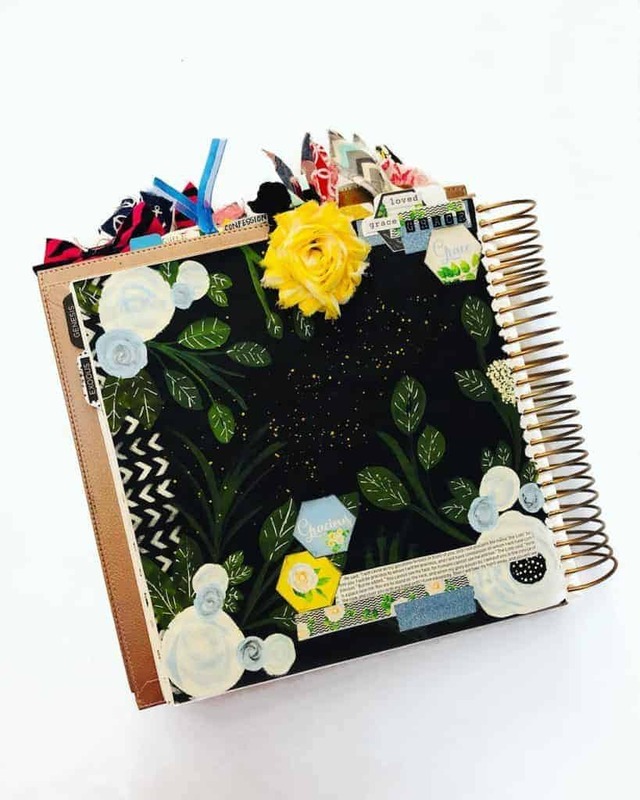 I love how these kits take the guesswork out of art and remind me of my scrapbooking and cardmaking days. Of course, I still make cards. The top rectangle can be used as a bookmark if you don’t use it when you assemble the kit. Just adhere it to a piece of cardstock, punch a hole at the top, and add some ribbon. I’d love to know what you think of the new kits! Will you be trying them out in your Bible this month? Let me know in the comments below!